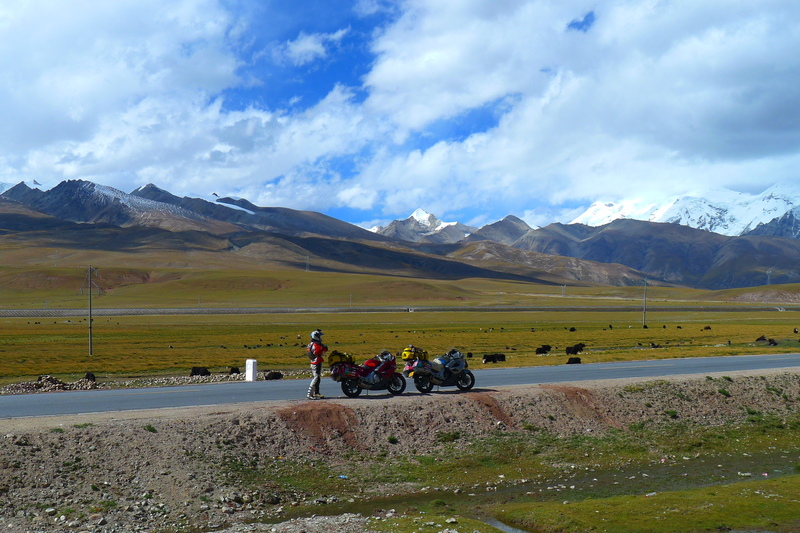 When we rode through Tibet (西藏) in September 2012, the People’s Republic of China was restricting access to Chinese citizens only. 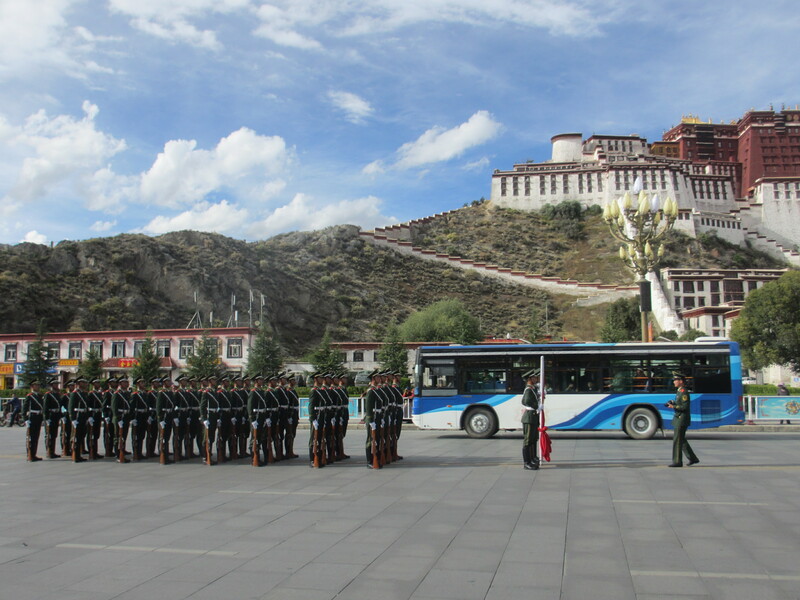 The only exception being that a “Tibet Travel Permit” might be granted to a foreign tour group, provided they all come from the same country, that their itinerary is organized and strictly supervised by an approved Chinese travel agency and they are accompanied by a guide at all times. All very bureaucratic, restrictive and undoubtedly expensive. 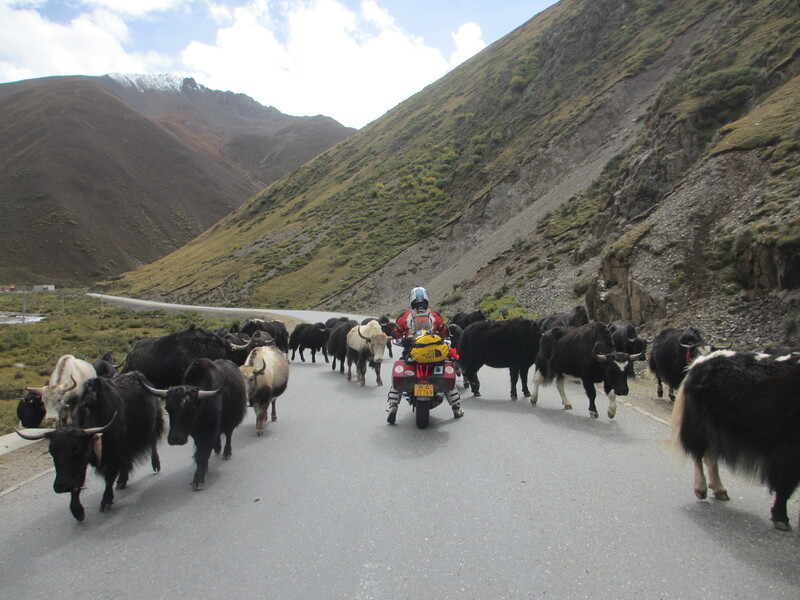 So, how could we ride into Tibet on motorcycles? For Fanny? No problem. Unlike the rest of the world she can move freely about China with her Chinese travel document, bian fang zheng ( 边防证)。 As for me? I could exploit a very slim loop hole in the current policy as I am a permanent Hong Kong resident and hold a Hong Kong Special Administrative Region Identity card. The reality is of course that the Chinese consider anyone, not ethnically Chinese, a “foreigner” and so using my Hong Kong ID holder status was at very best, “tenuous” and would mean I would have to be a bit lucky and apply whatever charm and wit I could muster to pass through the multitude of road blocks and security check points to get from one side of Tibet to the other. 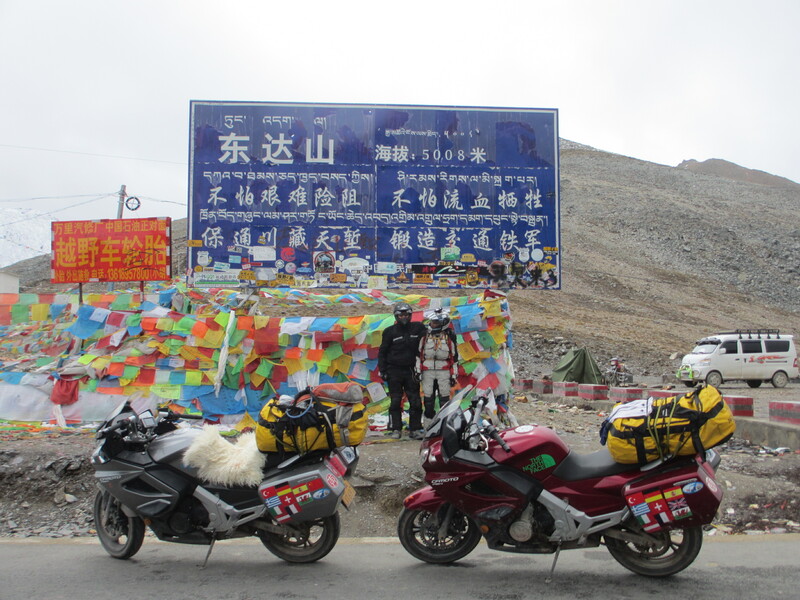 We had already ridden about 6,000 kilometers from eastern China through the central and southern provinces on our Chinese made CF Moto 650 TR motorcycles and now we were entering the truly spectacular province of Tibet from the equally impressive province of Yunnan. 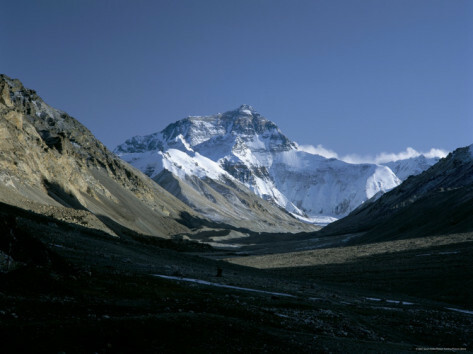 It is a vast region on the far west of the PRC that averages 4,900 meters in altitude and shares the highest point on Earth, Mount Everest ( 珠穆朗玛峰), with the Kingdom of Nepal. 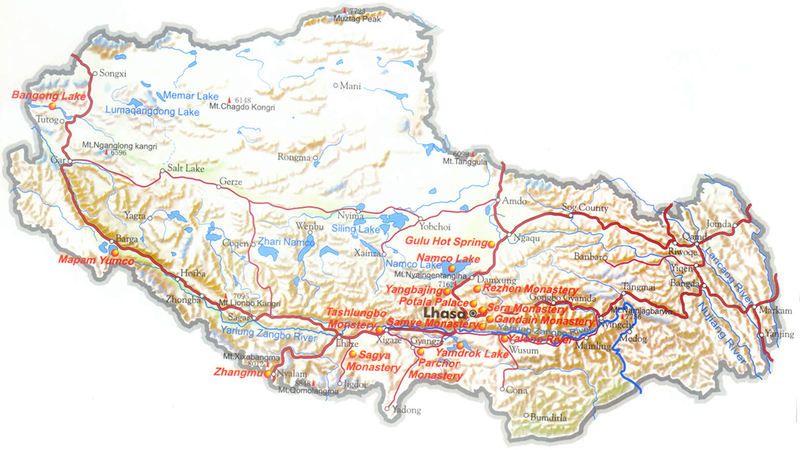 The reason why very strict travel restrictions were in place is that this so called “autonomous region” of China is in dispute and many of the indigenous Tibetan people want independence and greater freedoms. However, China keeps a vice like grip on the territory. China increasingly calls the shots in the new world order and pretty much does what it likes. 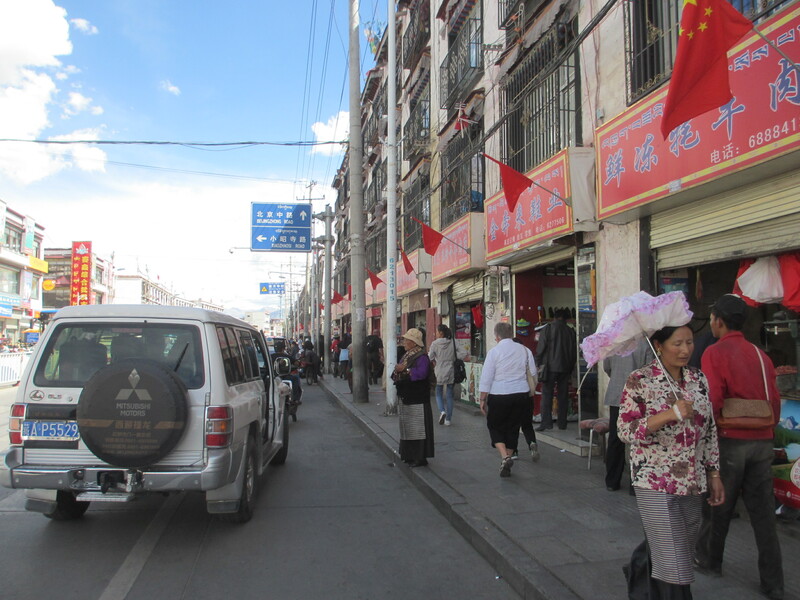 It is fiercely patriotic and defensive about what it calls domestic issues and sovereignty issues concerning Xinjiang, Xizang (Tibet), Taiwan, Diao Yu Dao and Xi Sha Qun Dao are not for discussion… especially by foreigners. 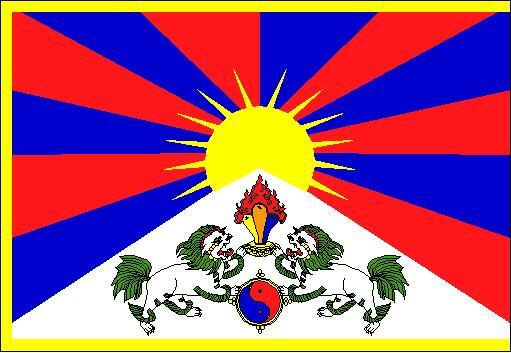 The current situation and history of Tibet is extremely complex and its well worth actually visiting and studying its long and complicated history before forming any opinions ( http://www.tibet.org, http://en.wikipedia.org/wiki/Tibet or http://www.dismalworld.com/disputes/tibet.php). 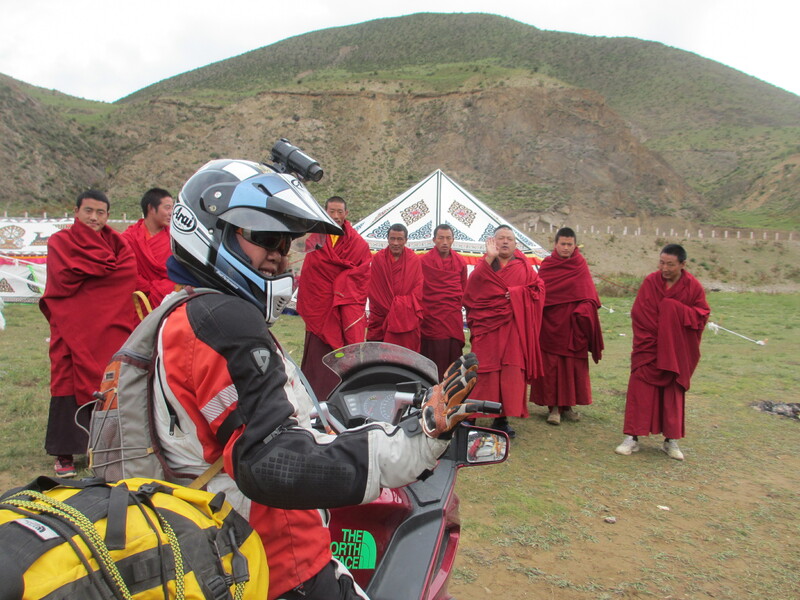 Despite the geographical splendour, fascinating culture, friendly people and some of the best adventure motorcycling I have ever experienced, our ride through Tibet was one of mixed feelings. Relatively speaking, I would probably have felt more at ease had I ridden through Vichy France in 1943. It was without doubt one of the most thought provoking places I have ever been to. 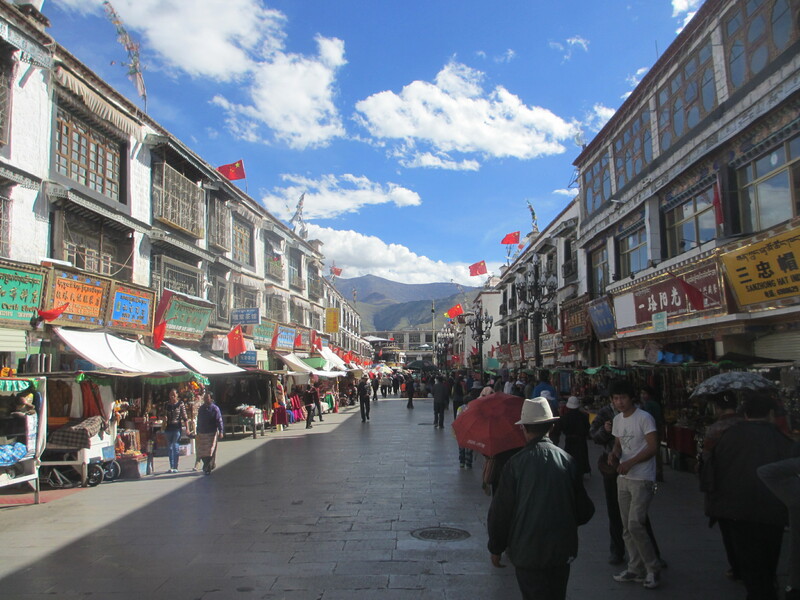 Like many parts of China access by foreigners to many of the historical sites or places of natural beauty is highly restrictive or unreasonably expensive. I wonder what Chinese visitors to the UK would say if the British authorities banned them from visiting Scotland or Wales, or charged them twenty to thirty times more than local people to visit tourist sites and attractions. I think they would protest loudly that its 不公平 (unfair). 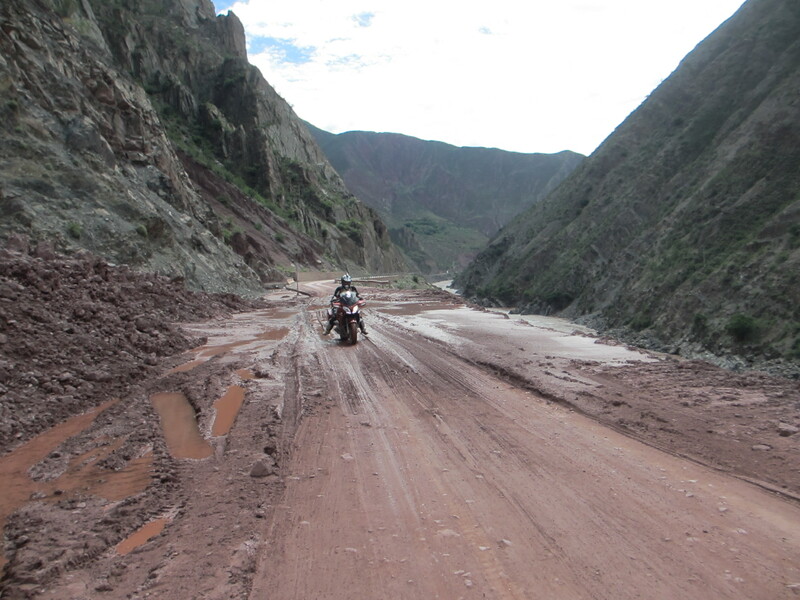 A bit muddy and rocky in places … no real problem though. 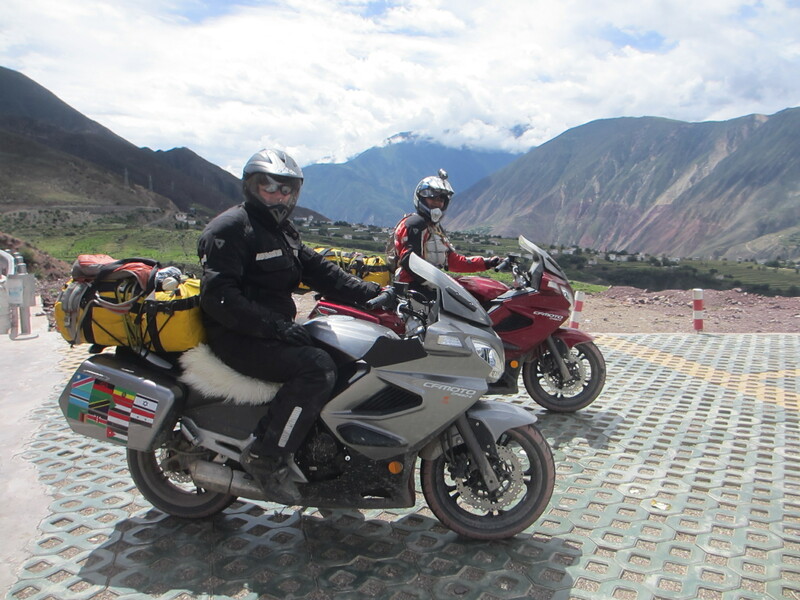 Our bikes are not true adventure enduros like our KTMs, but these CF Moto 650s are very decent long distant tourers and seemed fine with everything that we came across. Steep drops and spectacular views. 3,000 – 4,000 meters towards Mang Kang. We have started taking Chinese medicine called ” hong jing tian” for altitude sickness. 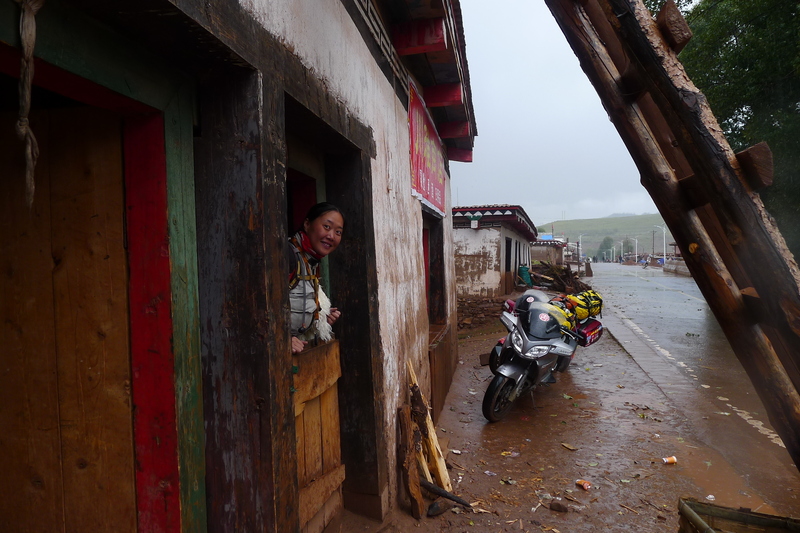 A bit like Ethiopia … we shared the road with many creatures… but none as dangerous as “Fujian peasant” in his Toyota 4×4 with Shanghai racing circuit diagram on the back window, a years supply of instant noodles on the back seat and Mrs Fujian constantly throwing rubbish out the windows into the Tibetan lakes and streams. They did it all the time. 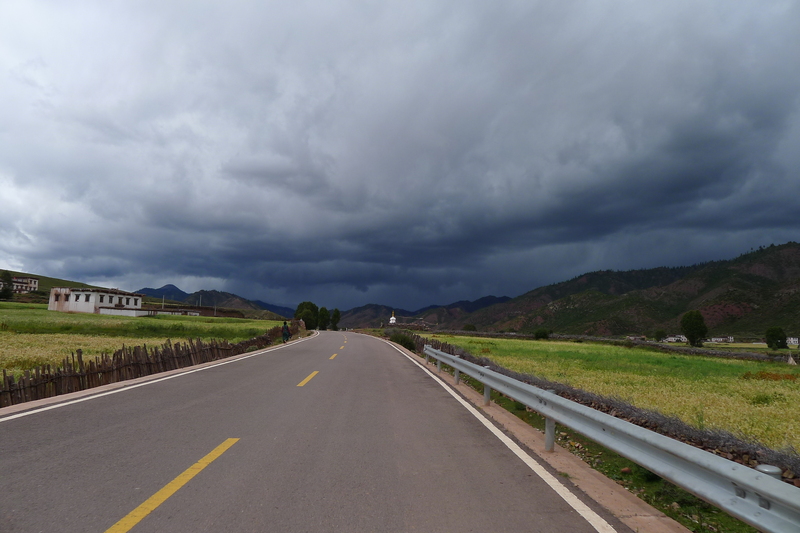 There were many cyclists on the Kunming to Lhasa road. An amazing feat and respect to them. 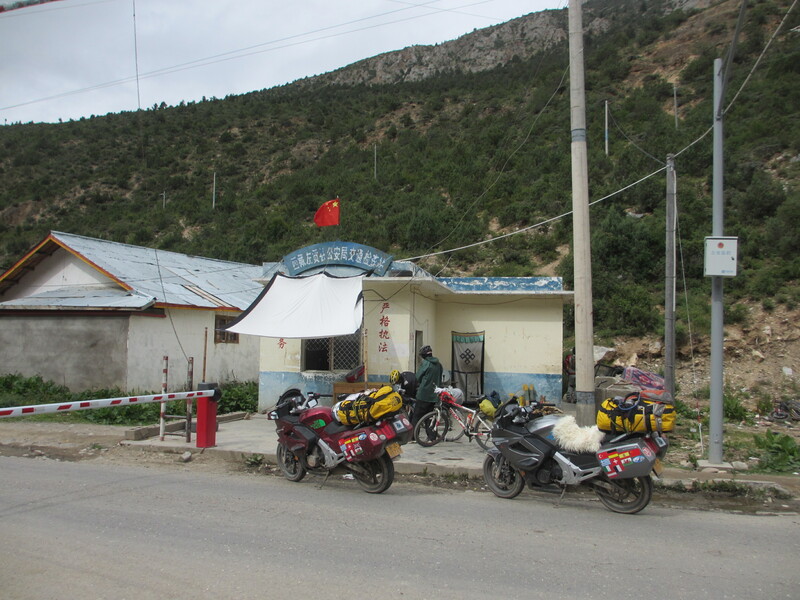 When (and if) they complete the arduous ride and get to Lhasa they usually ship the bikes back by the very efficient Chinese postal services or Kuai Di. 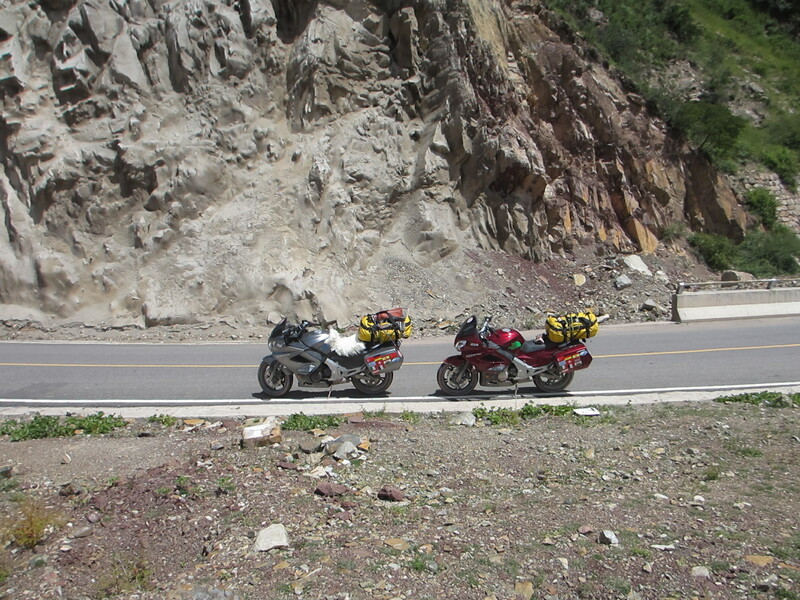 We saw very few bikes going the other way, and virtually no bicycles beyond Lhasa. 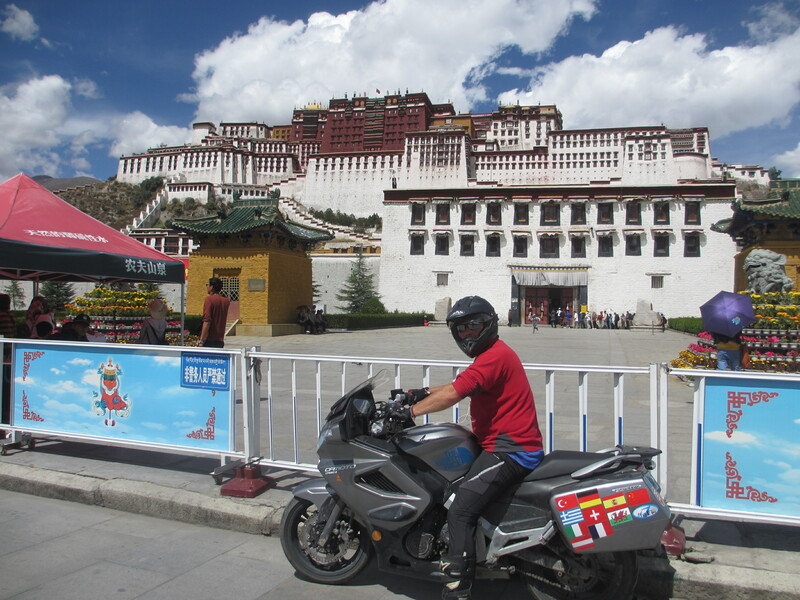 I think we saw a couple of local small cc motorcycles and absolutely no other foreigners beyond the famous tourist attractions in Lhasa where they were being shepherded from site to site like sheep. The CF Moto 650 TR bikes have been awesome… a big surprise. 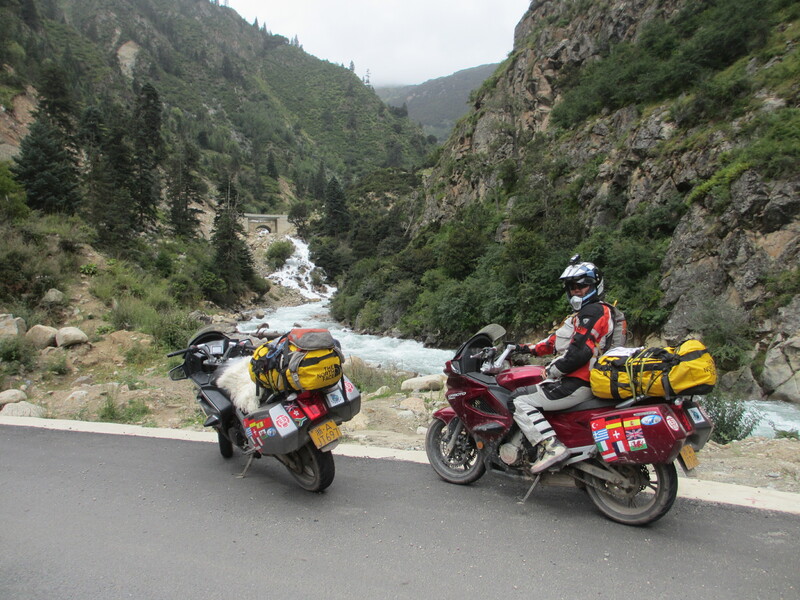 I would use them again if I did the same ride, or perhaps the Royal Enfield …. after all it is the Himalayas. 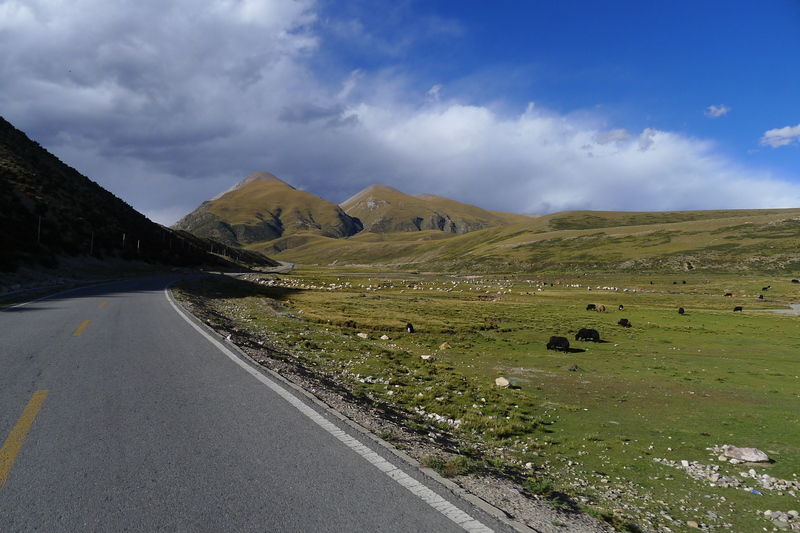 In eastern Tibet the road goes up and down between 3,000 meters to 4,000 meters – many times. 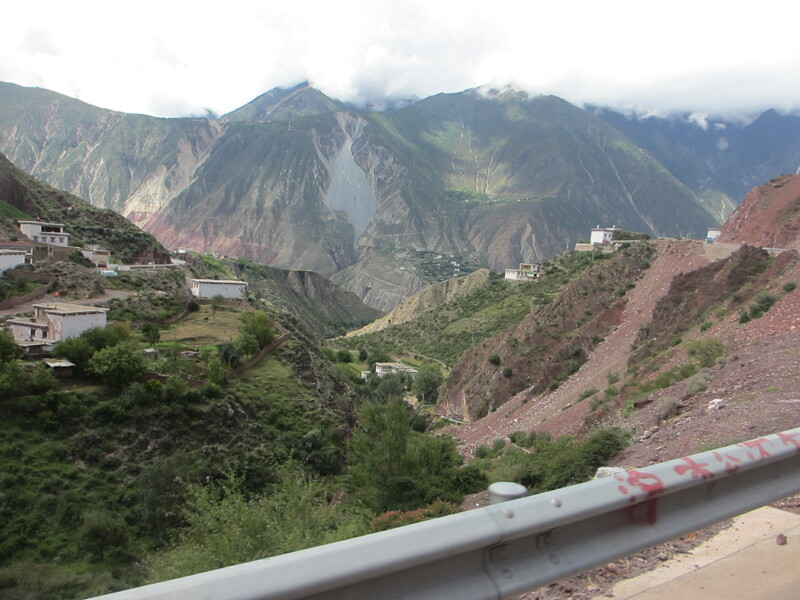 The roads are often carved into the side of very steep slopes and sometimes the road has completely or partially collapsed or has debris strewn over from landslides. It was a bit nerve wrecking on our bikes and I cannot imagine driving one of the trucks with the wheels hanging over the side. We did see some unlucky ones that had gone over the side. Fanny cautiously looking over the edge of the road. Much more precarious than the impression given by the photograph. 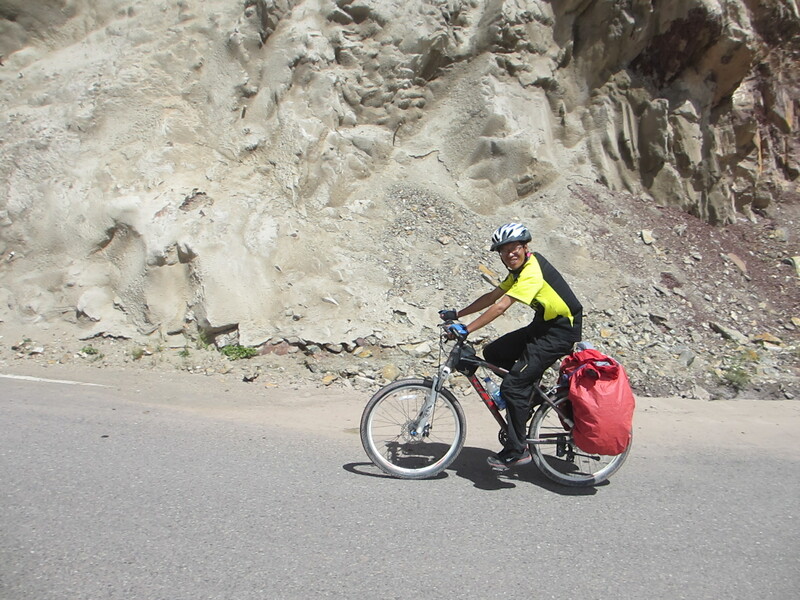 We rode through massive pine forests around the 3,000 meter mark for hundreds of kilometers. So much for the deforestation debate. Seems Chinese forestry is as advanced as that in Bavaria or Canada. 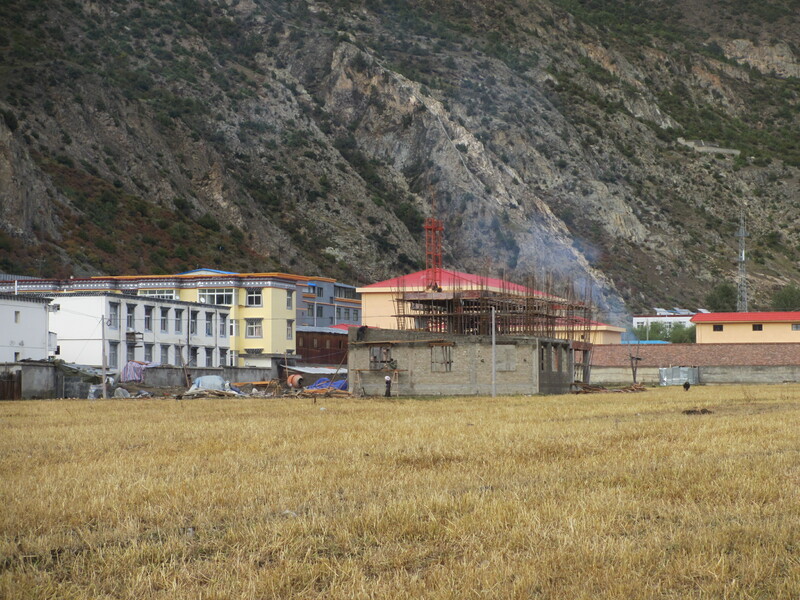 A typical Tibetan farmhouse in the eastern side of the province. 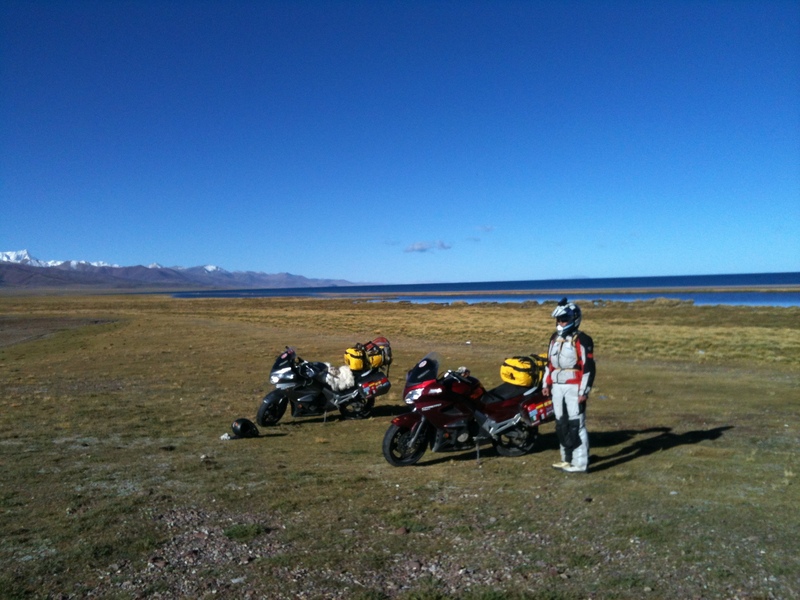 Our first 5,000 meter pass… many to come. The last time I was at 5,000 meters was on the summit of Mount Kenya and I was out of breathe then too. Taking refuge in a local shop during a flash storm. The storm charged through the valley with lightening and thunder crashing around us and then disappeared as quickly as it came. 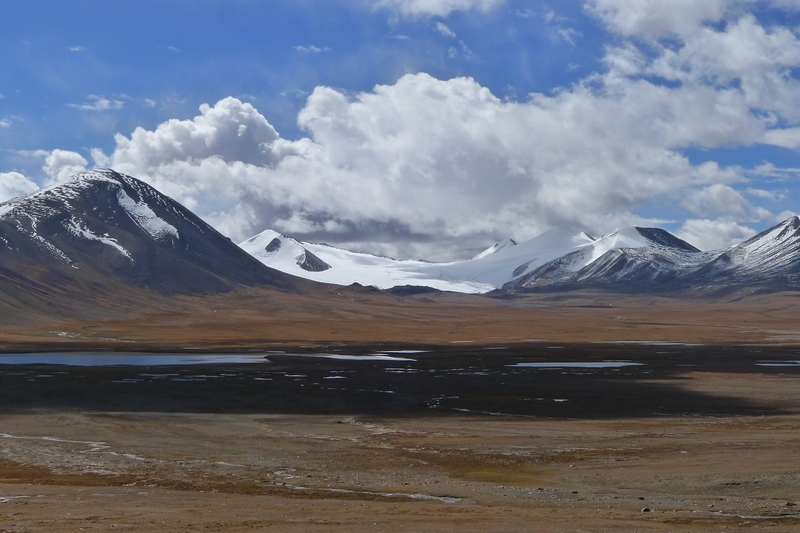 We became all too aware how quickly the weather could change in the Himalayas and Tibetan Plateau. 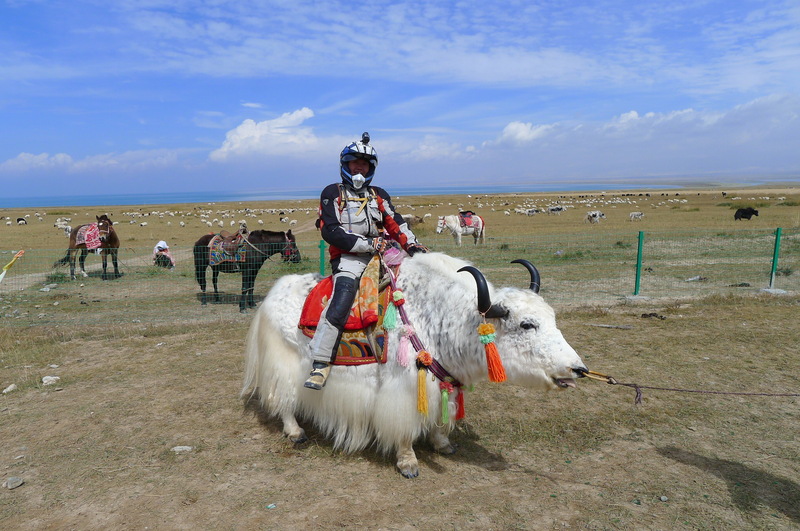 Yaks milk tea …. takes a little getting used to. Not sure what smelt more lively.. my wet sheep skin seat cover or the tea. I told Fanny it would make her eyes water. Storm rapidly approaching down the valley. Like something out of the film “The Mummy”. Within minutes we were in the middle of a storm with lightening and thunder crashing around us. I have developed a particular fear of lightening having narrowly escaped being zapped in the Nubian desert whilst riding my motorcycle across Namibia. Here high up in the mountains I felt particularly exposed again. 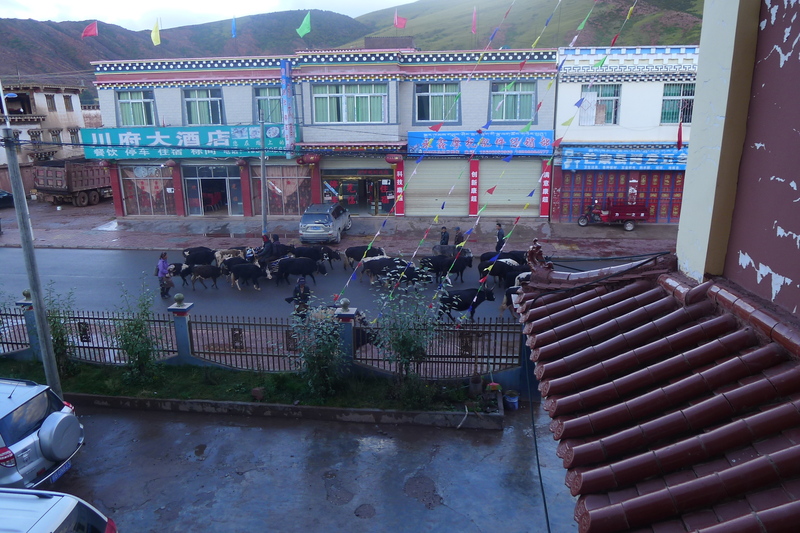 Gazing out of our hotel room at yaks wandering through the town center. 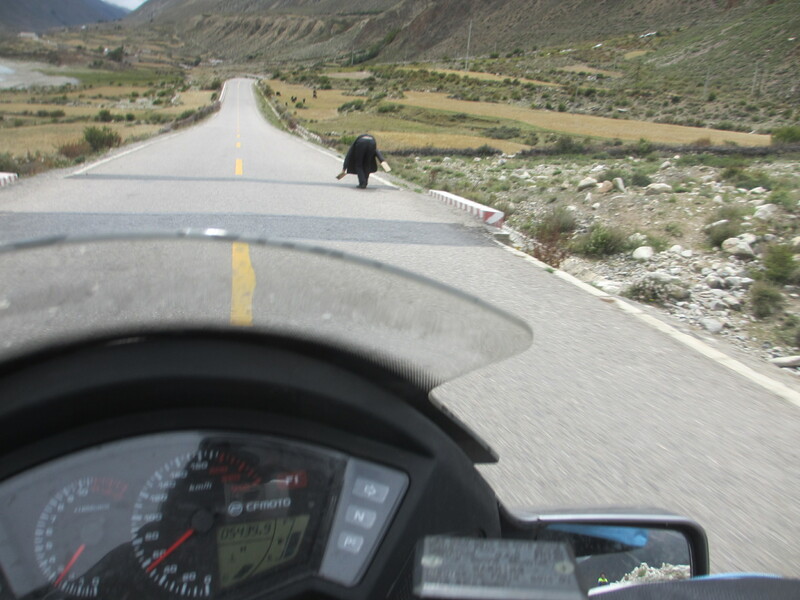 As we got deeper into Tibet Fanny became more anxious that I should conceal myself. 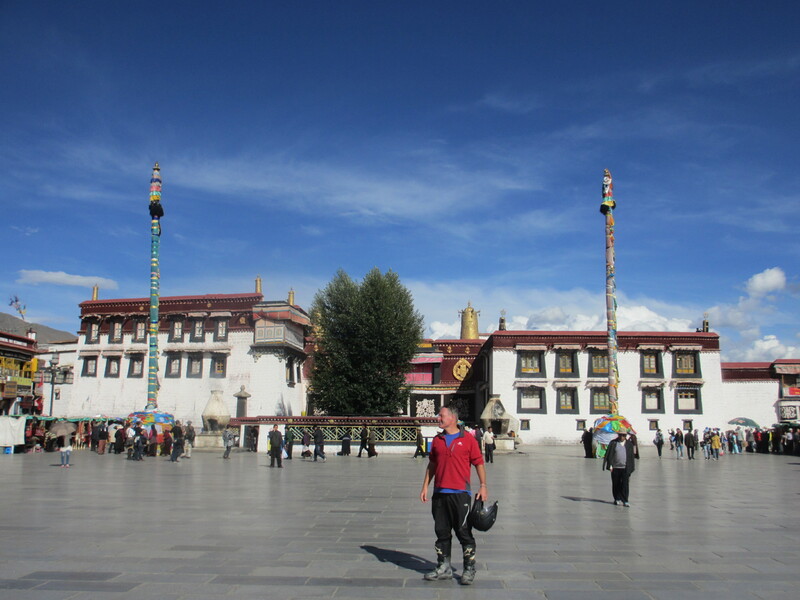 I was the only foreigner in this town, and indeed only saw other foreigners when we got to the capital, Lhasa. Even then they were in a tour group and being herded about under strict supervision. 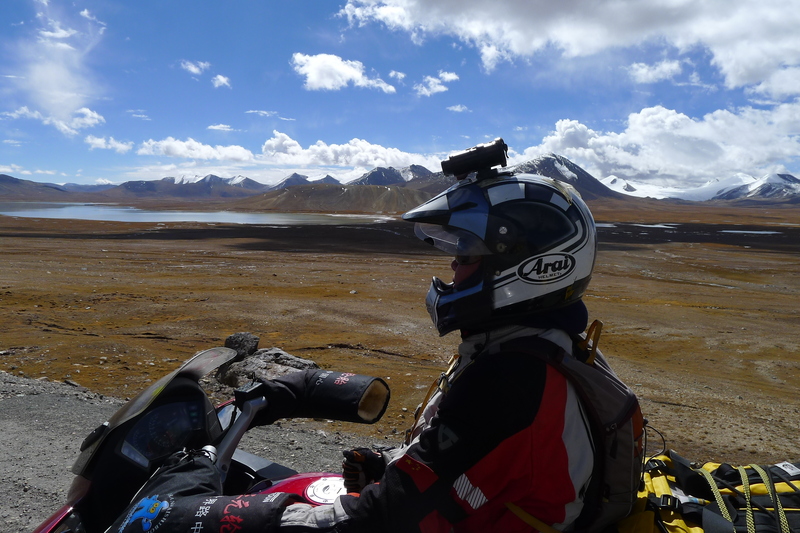 Luckily most of the time I was in riding gear with a crash helmet and riding a Chinese registered motorcycle … with a Chinese woman. Back on the road having managed to get through the first real challenge at a security check point on the exit from Mang Kang. I think it was the “Hong Kong Pacific Place Cinema Movie Magic discount card” that got me though or my ”警察兄弟“ patter… probably the latter. Entering town called 左贡。。。Tamade…. 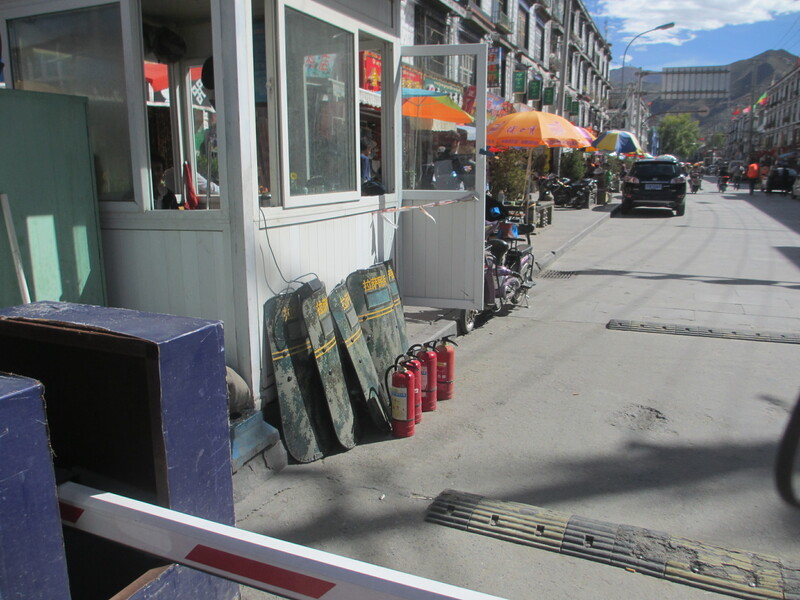 this time there were 特警, 警察, 军人 at the security post. Until this point we had ridden around them, under the barriers and confidently BS’d and smiled through the previous security check points. 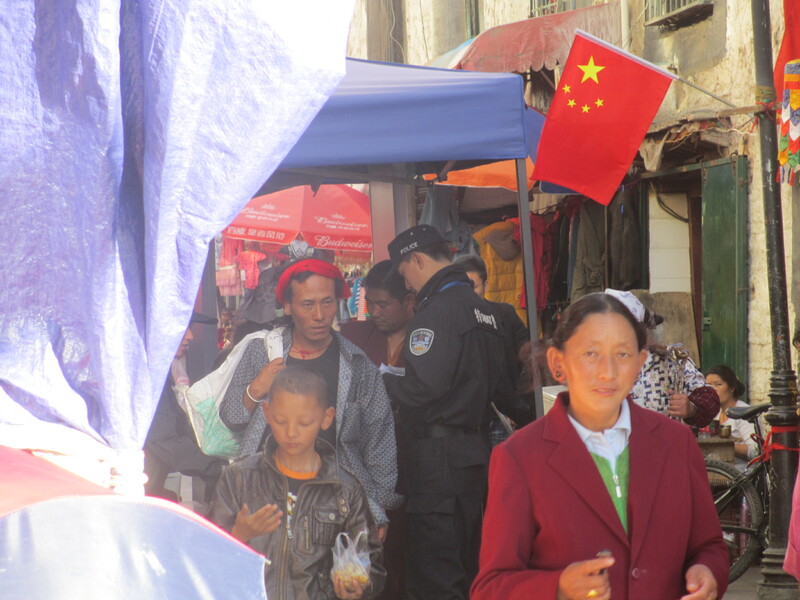 This time they were not impressed with my selection of Hong Kong discount cards and so we were detained. Two hours later after boring the pants off them they let us go… with a proviso that I shut up. 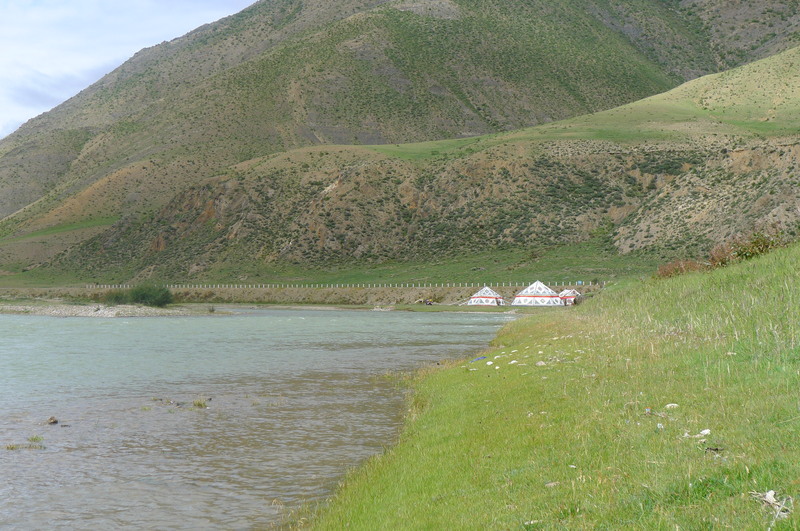 Whilst pondering whether we will run into another road block we saw some Lamas sitting by the side of a river in a very peaceful and idyllic location. We asked if we could camp with them and they said kindly said yes… and so started a lovely two day chapter of our adventure where we forged some wonderful friendships. 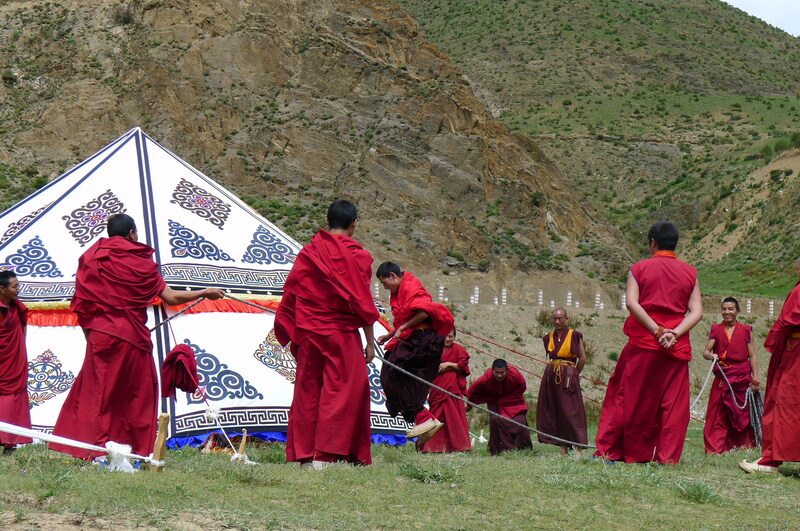 We were putting up our little expedition tent, but the Lamas gave us this much more impressive one to use. 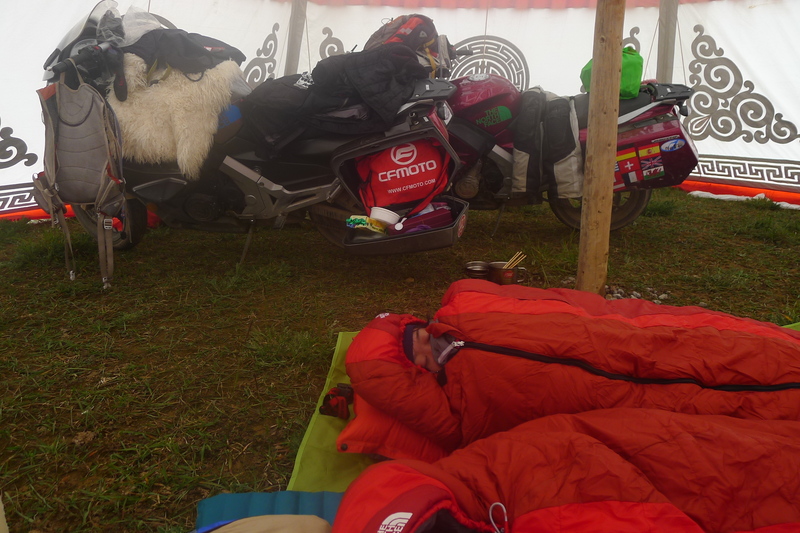 Fanny wrapped up in her North Face expedition sleeping bag together with our bikes inside Lamas’ tent. We were at 4,400 meters and it was bitterly cold during the night and I discovered that drinking beer at altitude gives you the mother of all headaches. 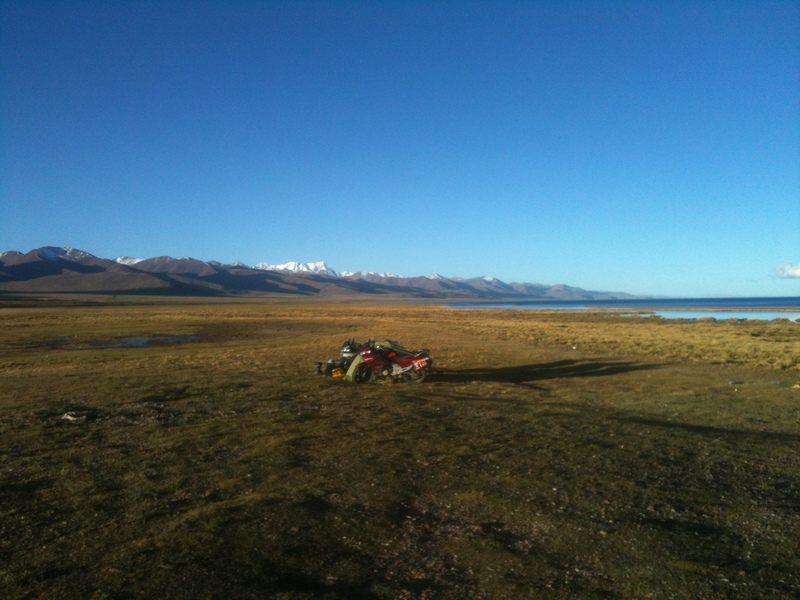 Lesson learned, and clearly forgotten as later on in central Tibet at 4,900 meters we drank a bottle of champagne next to Sky Lake (Nam Tso) to celebrate. So!!!! Word to the wise… don’t drink alcohol at altitude. In fact, just drink the local tea. 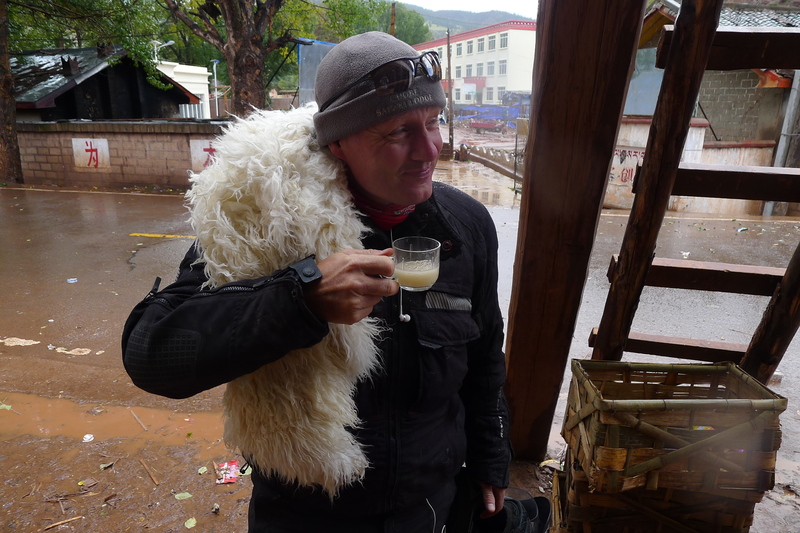 The salty sweet earthy tasting yaks milk brew found everywhere does help with altitude sickness, as did the Chinese medicine we were taking. 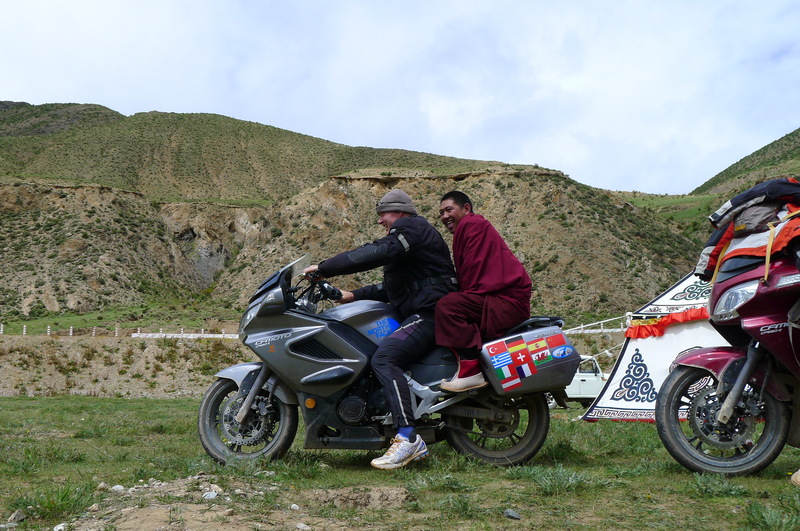 Giving one of the Lamas (Si Ba) a ride up to the temple higher up the mountain so he could charge his mobile phone… somethings are the same where ever you live. 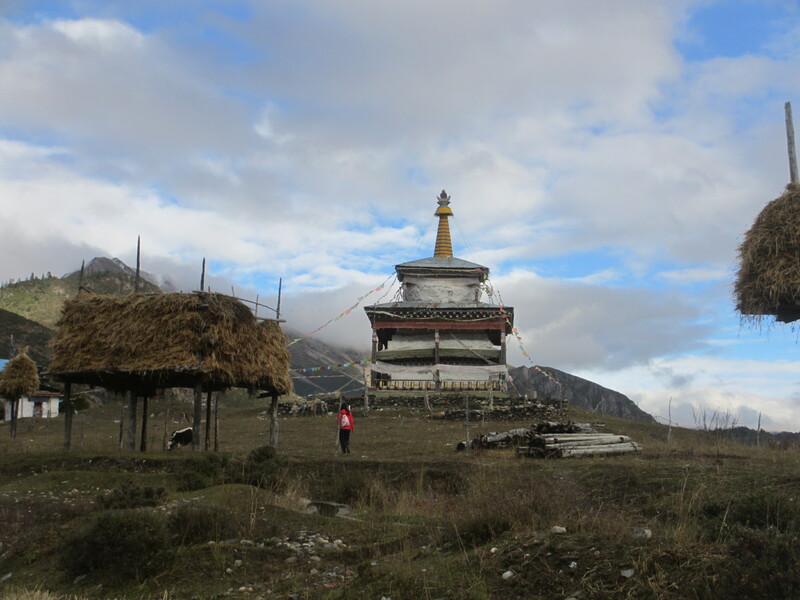 A visit to the Lamas’ temple with our friend Si Ba. Fanny interfering with the cooking plans…. 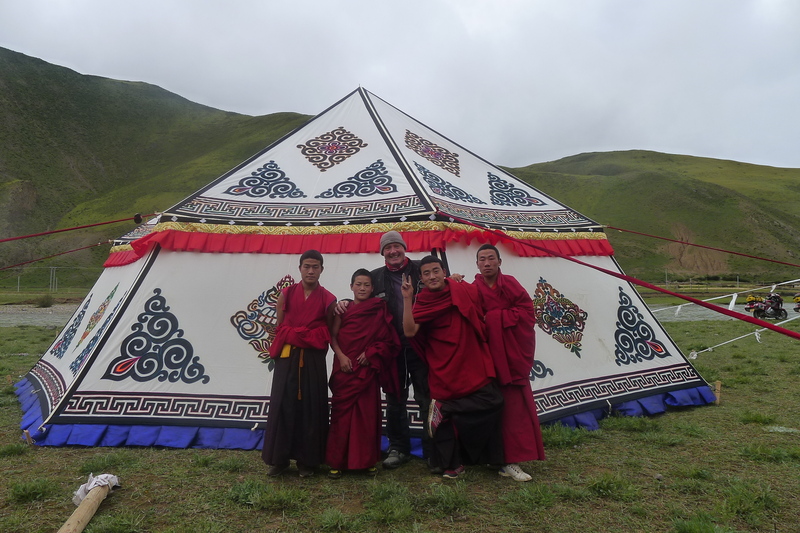 We moved to our own tent so the Lamas could prepare for the special visit of 小活佛 (little living Buddha) from Lhasa. 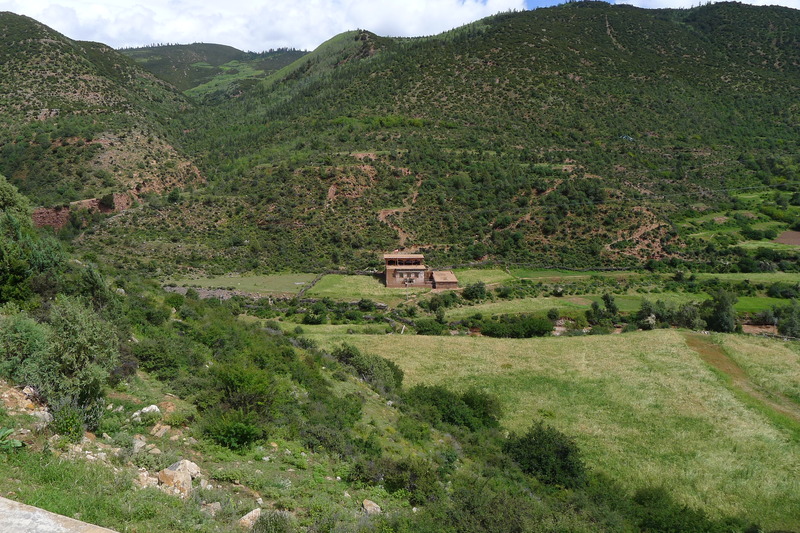 During the night we could hear the Lamas chanting and playing drums, cymbals, trumpets and the eerie repetitive low bass of the Lama long horn… As they say, you have to actually be there to truly experience the ambiance and spirituality. We were very privileged and this bit of our trip will always bring back fond memories. The next day we were invited to join the festivities. 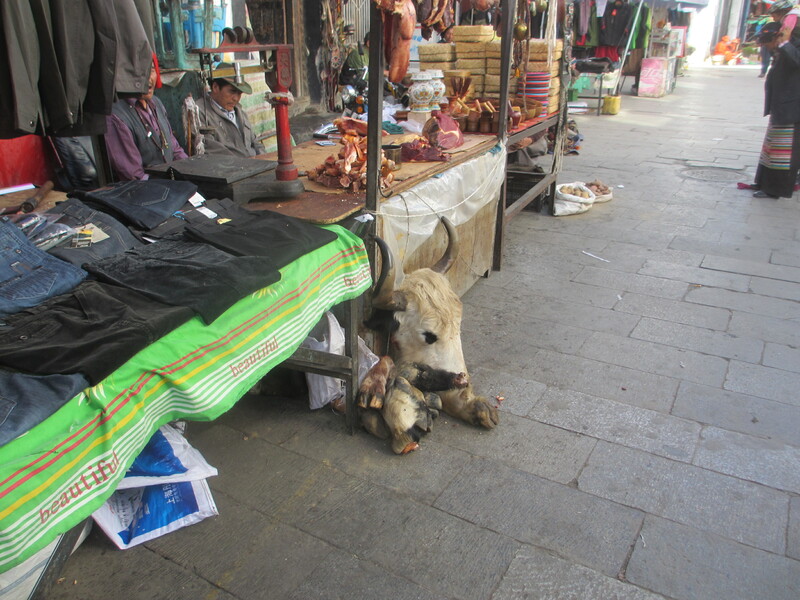 Unlike the monks I lived with in wu wei si in Dali, Yunnan, these Tibetan lamas are not vegetarian. 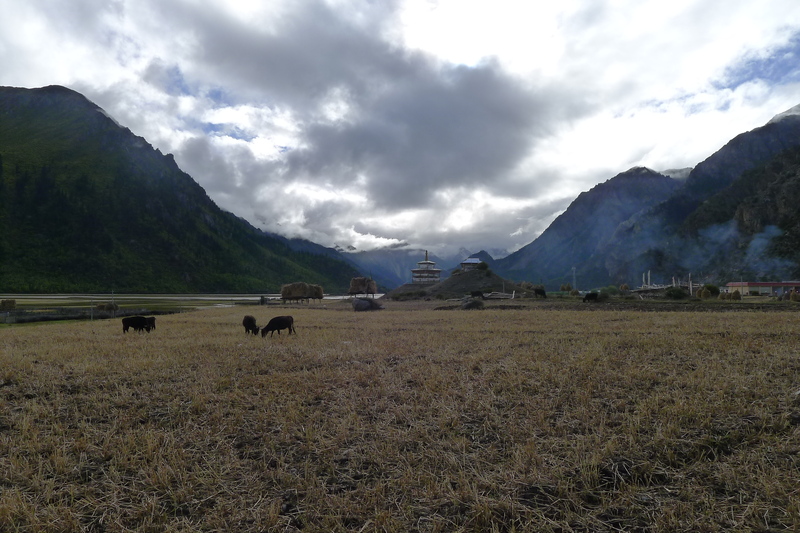 They do eat meat and yaks meat, yaks butter, yaks fermented cheese, and yaks yogurt seemed to be staple foods, along with fresh vegetables from the local area. 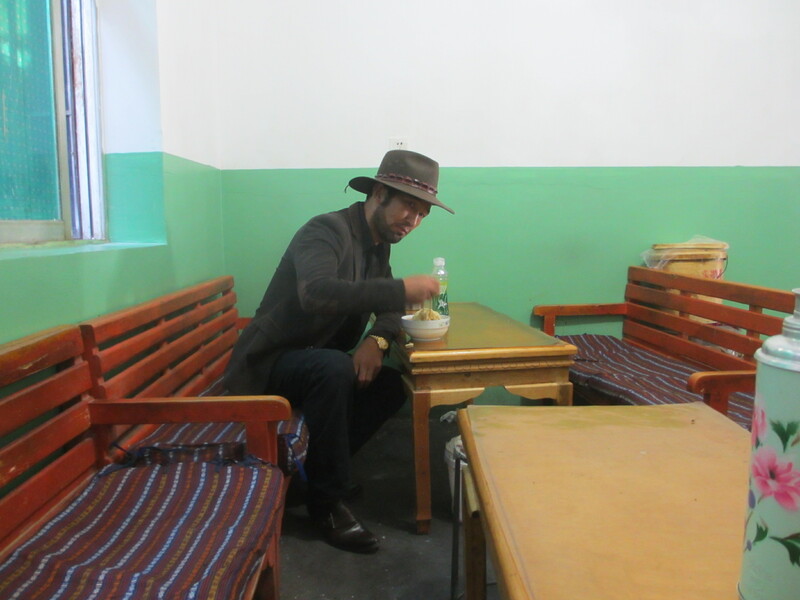 I am eating for the first time yaks yogurt and rice…. a sort of variation on the famous British rice pudding. The taste is somewhat challenging, as is eating it with chop sticks. Little Living Buddha … 小活佛。 A very shy boy who bears a striking resemblance to another shy boy I know when he was the same age. 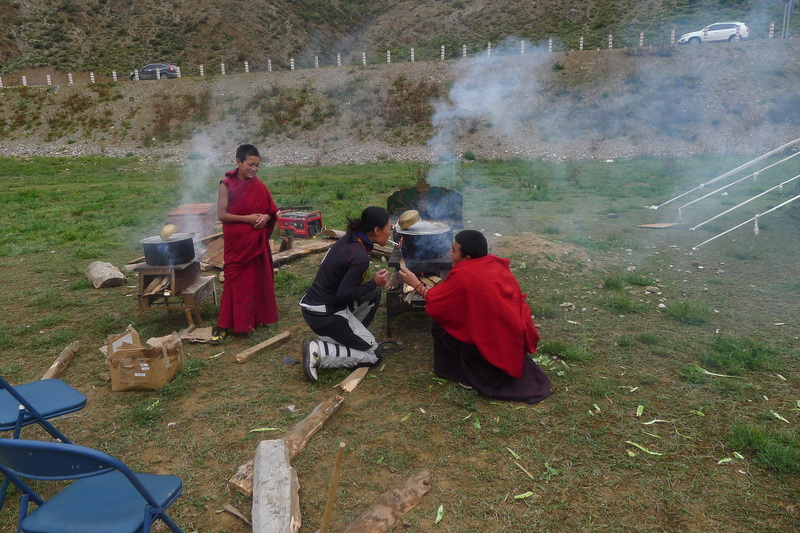 Our friend Si Ba is one of the Lamas who looked after him and ensures he receives the correct education and upbringing. We were constantly reminded of the Chinese influence in Tibet by the new middle class Chinese exploring the mountainous province in their Hi-Tech 4x4s, the young cyclists performing the Kunming to Lhasa right of passage, and more acutely by the extremely long military supply convoys that sometimes consisted of a hundred army trucks heading back and forth to Lhasa. 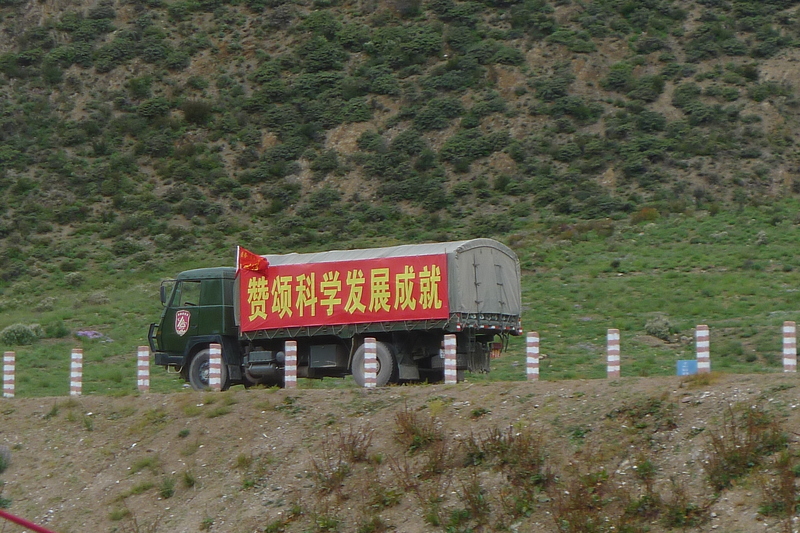 These convoys are often used in propaganda films as they evoke images and impressions of “Long March” heroics. 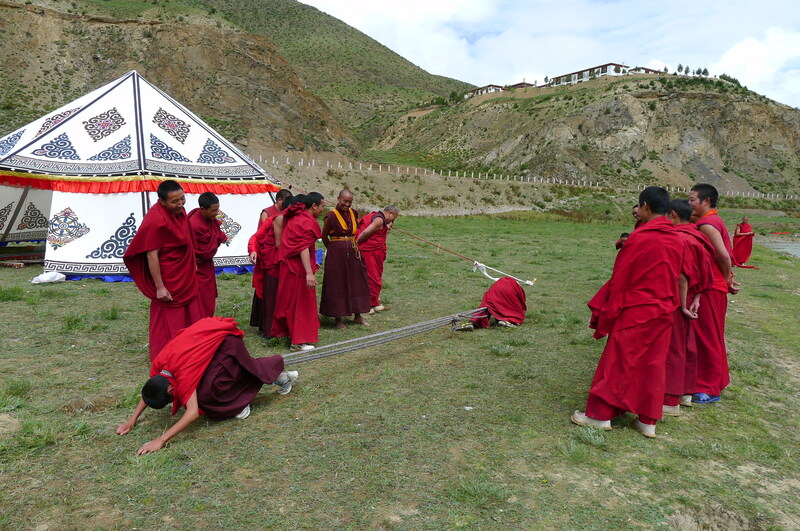 I politely declined to participate in the Lama tug of war games for obvious reasons. Right next to the temple (sen above) the Chinese authorities are building a new four story concrete police station with all the architectural splendour and creativity used in every second and third tier cities we saw across China… i.e. zero. A slightly disturbing sight to my mind, but the explanation given by the omnipresent plain clothes “protector” person was that for the first time in centuries the temple was being burgled and so a police presence was needed. Really? I doubt it. The bikes always popular with everyone. 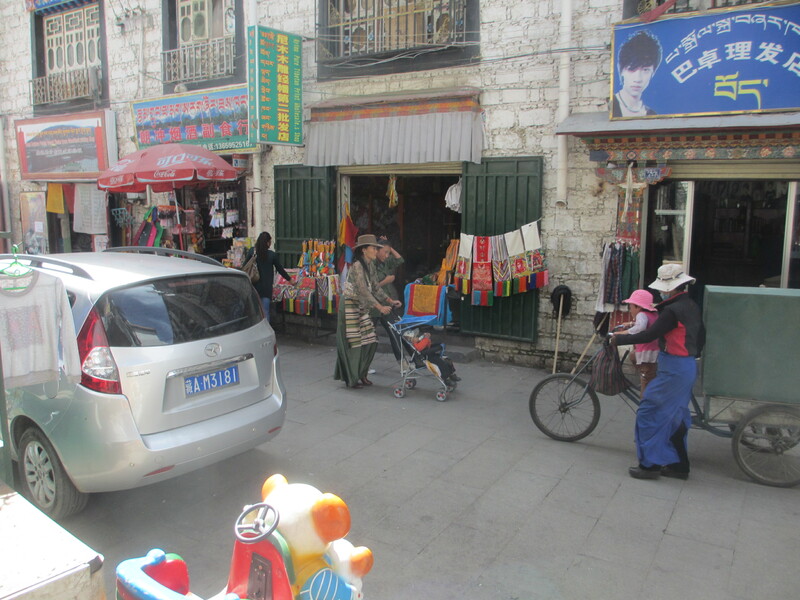 Little Living Buddha (小活佛） has a look at our bikes with the other Lamas. Lounging about after lunch by the river. This young fellow was a real character. His only English was “Let’s Goooo!” which he used often and between the many chores he was given he would spend time with us. Little living Buddha is seated in the background. 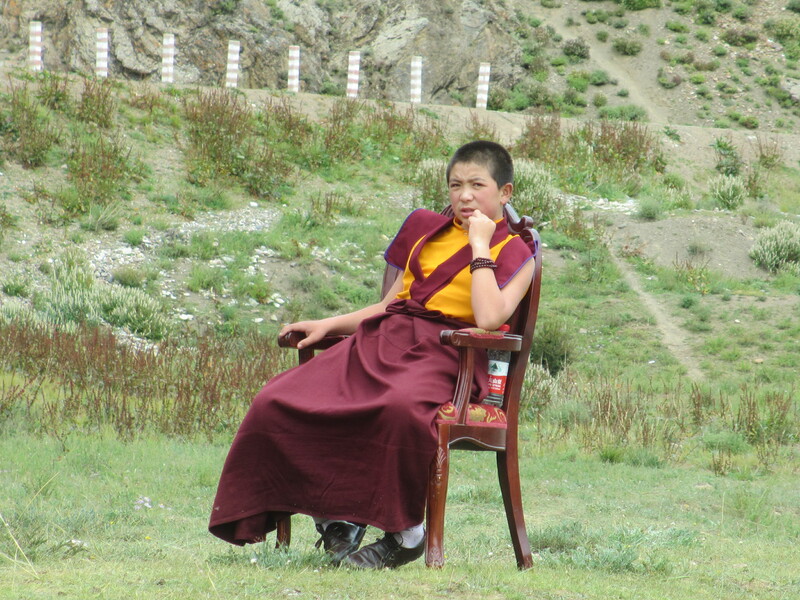 The contrast between the lives of both “Lama” boys who were about the same age was immense. 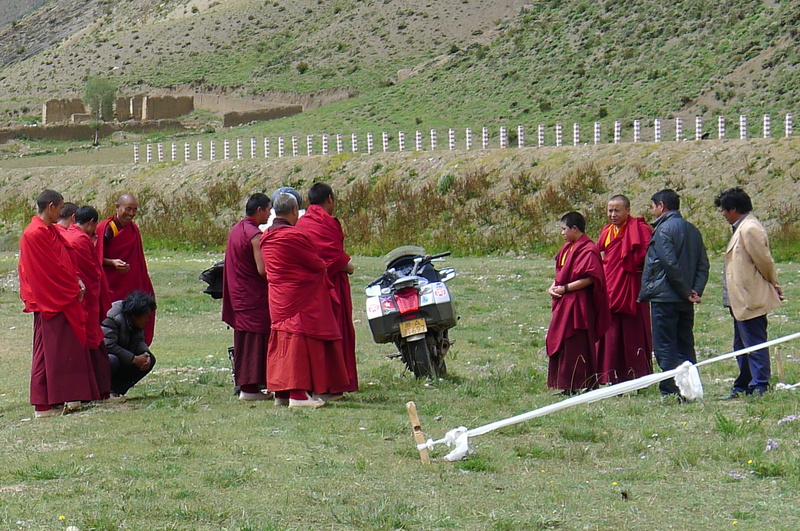 Eventually we had to go and all the Lamas came out to bid us farewell. It was a bit tearful as I think Fanny had made a real impression and they seemed extremely fond of her. Fanny, is extremely smart, gregarious and easy to get on with whether you are from the east or West. She is a true ambassador for all that is good about China and should be in their diplomatic service. 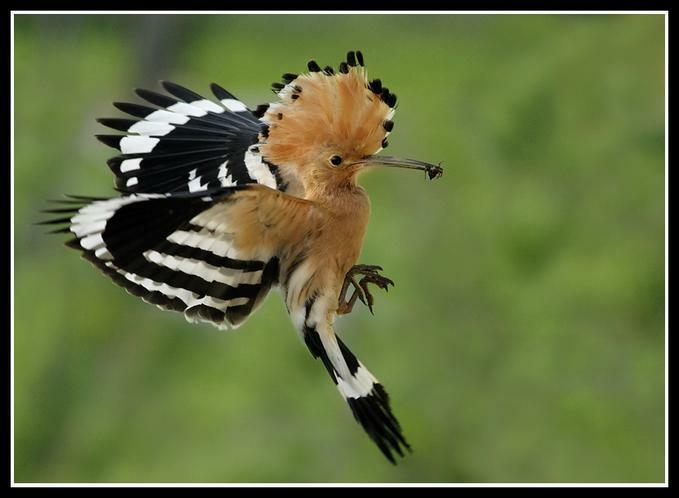 As we rode along the beautiful river path towards the main road that will take us to Lhasa, two hoopoe birds flew alongside us with their crests extended as the Lama’s waved goodbye…. if that isn’t spiritual I don’t know what is….. 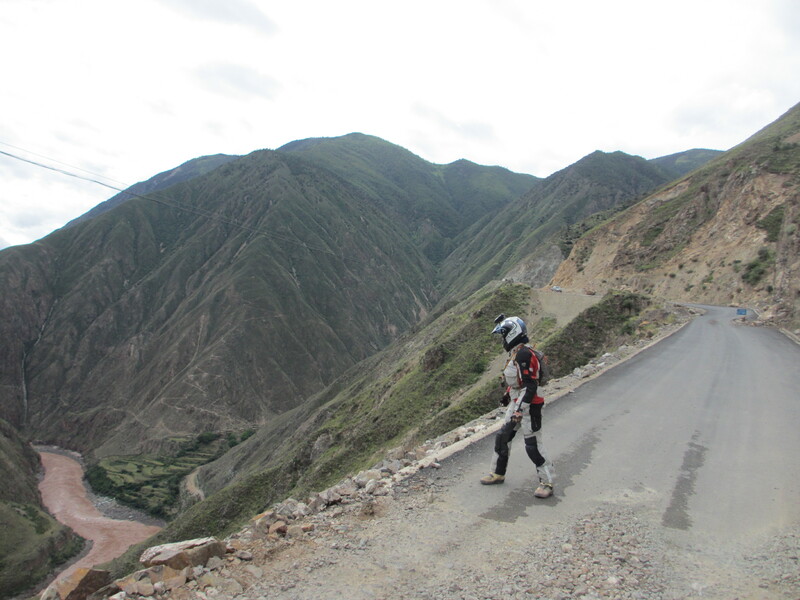 Riding along generally good tar roads, with occasional potholes, and stretches of gravel, mud or water flowing from streams across gullies. Biggest hazard is other drivers. 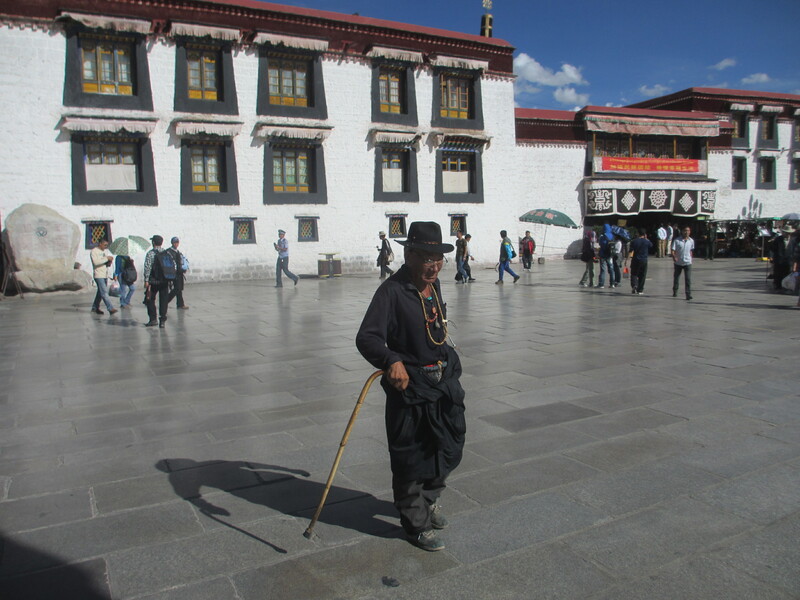 This guy in front is on pilgrimage to Da Zhao Temple, Lhasa and every few steps lies prostrate towards direction of Lhasa. Some of these pilgrimages can take years and occasionally people die. The Chinese side of Ran Wu …. 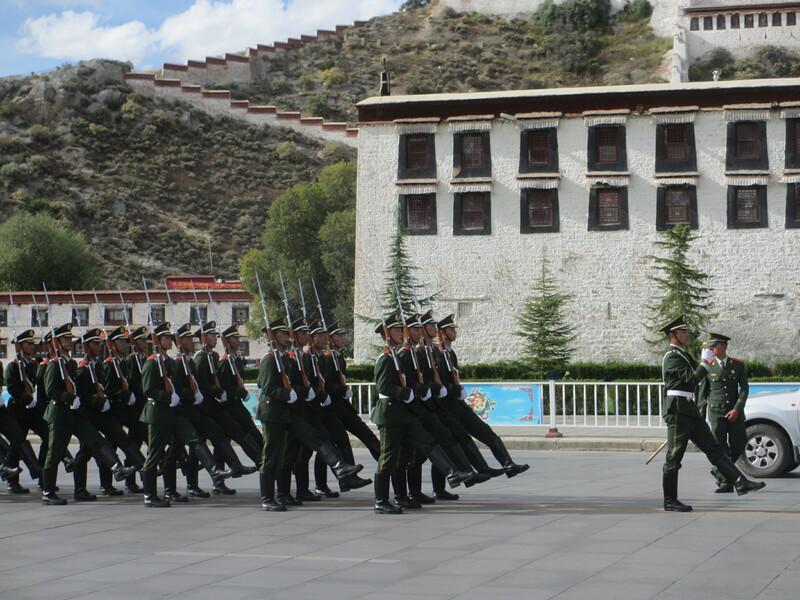 nearly every small village and town in Tibet has a Chinese garrison regardless of how pristine or historically relevant the place may be. There are thousands of uniformed and plain clothed security police, army and often huge barracks for the military supplies conveys. Invariably ugly, intrusive and looking like an unfinished construction site. 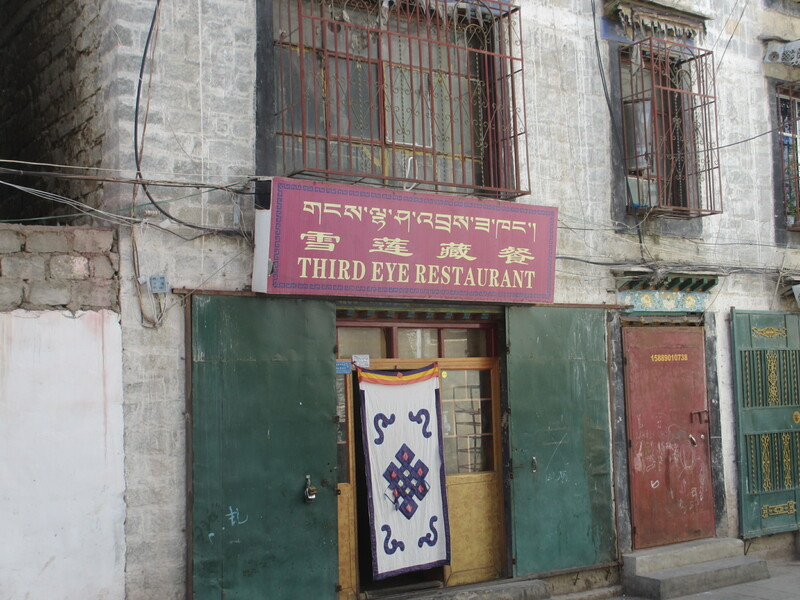 No National Trust in Tibet, nor any architects apparently. Rubbish and sewage strewn everywhere. Nearly every Chinese person we saw just throws rubbish straight into the lakes and streams or throws them out the windows of their vehicles onto the hillside. Everything is slovenly…..and with no respect for the environment, nor with any real respect for the indigenous people. The Chinese government needs to start acting responsibly. Ran Wu.. with beautiful lake, although waters have receded for many reasons, including climate change and hydroelectric projects upstream. 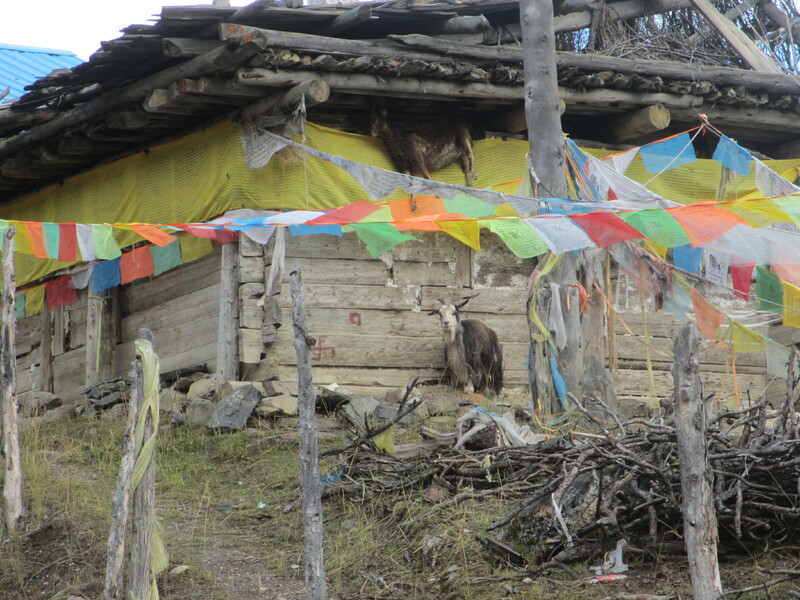 There is definitely a live goat at the bottom of this Tibetan building, but I am not sure about the other one up in the rafters! 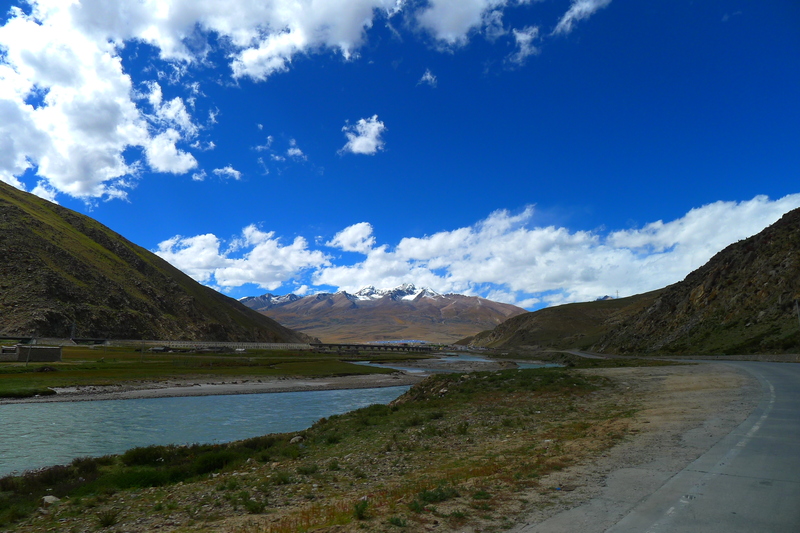 The geography of Tibet is always spectacular, fresh and BIG. Its pleasing that it will be there long after man has gone. I am reliably informed by a Hong Kong friend, Franki that these are Char Char stones. If anyone knows anymore about what they are and for please leave comment. 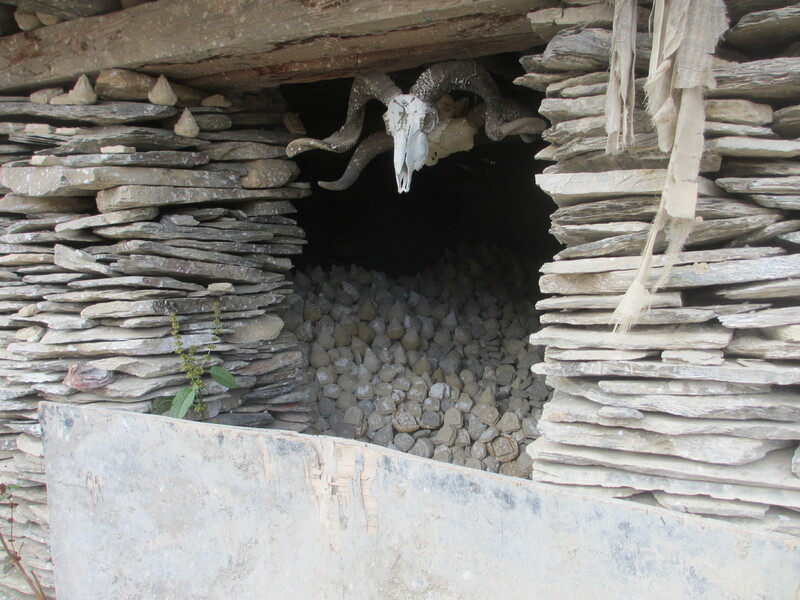 Under ever nook and Fanny are tiles carved with Tibetan prayers. 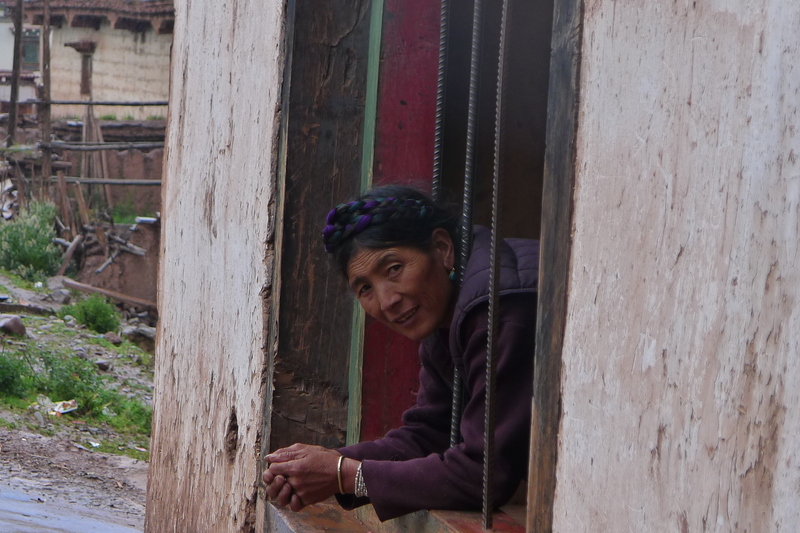 One of the photos that was sent to us by the travelers we met en route. Their cameras often better than ours. 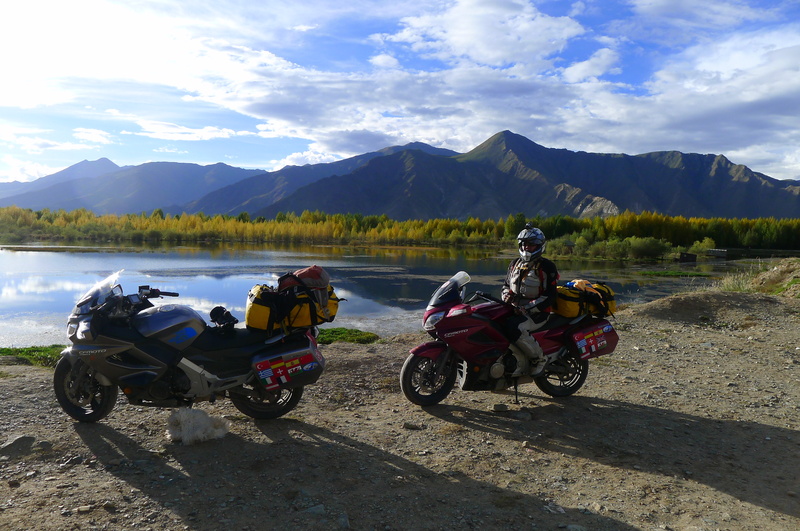 Riding towards Lhasa high up on Tibetan Plateau… Beautiful lakes and forests. 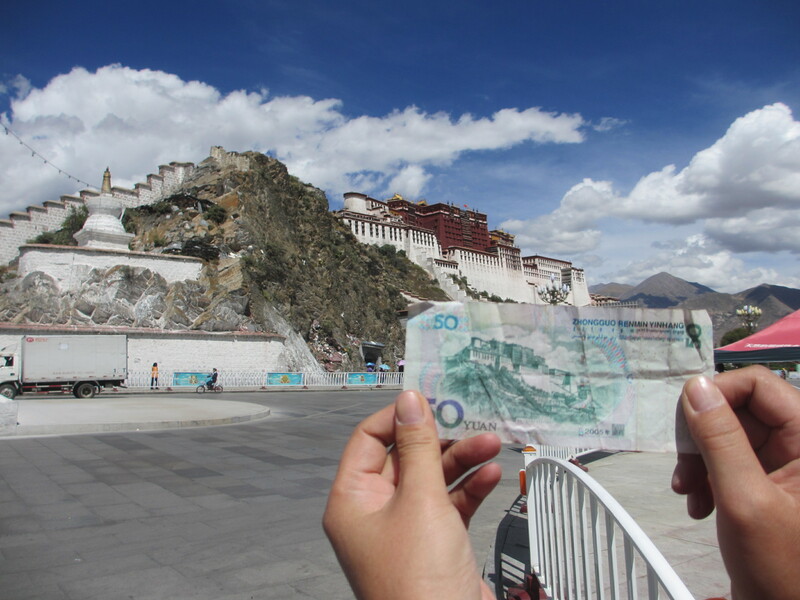 We did the back of the RMB 20 note in Guilin, now the back of the RMB 50 note in Lhasa. Be a good citizen and make sure you are flying a crispy new red flag. 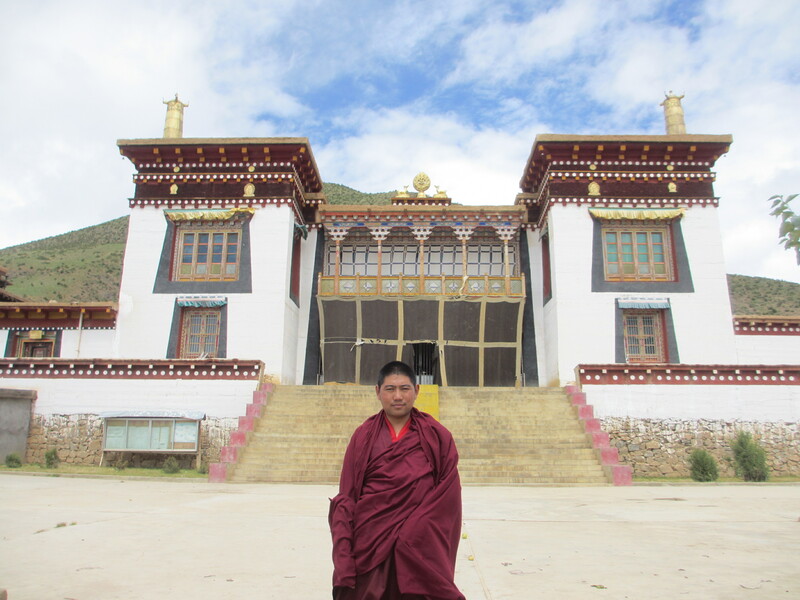 Our Lama friend Si Ba outside the holiest temple in Tibet, “Da Zhao” in Lhasa. 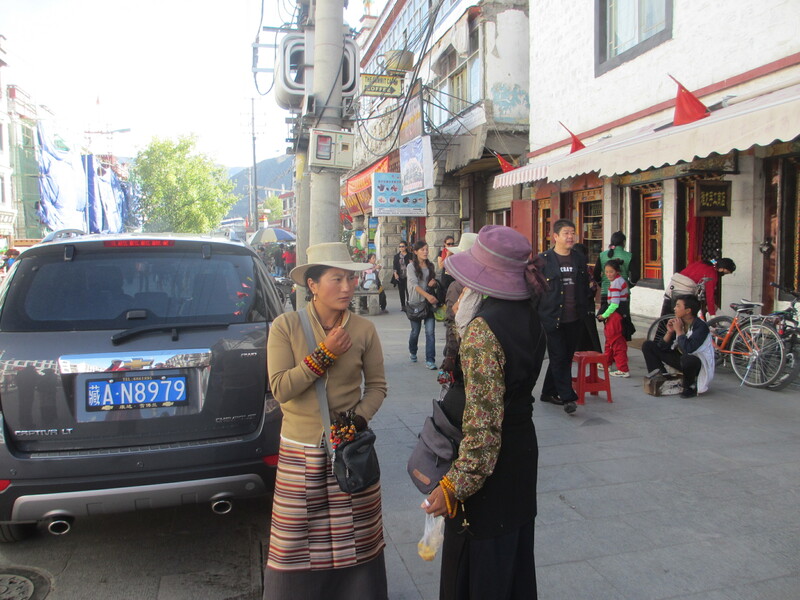 The Tibetan’s have a very different language, customs, appearance and way of life to that of the occupying Han Chinese. 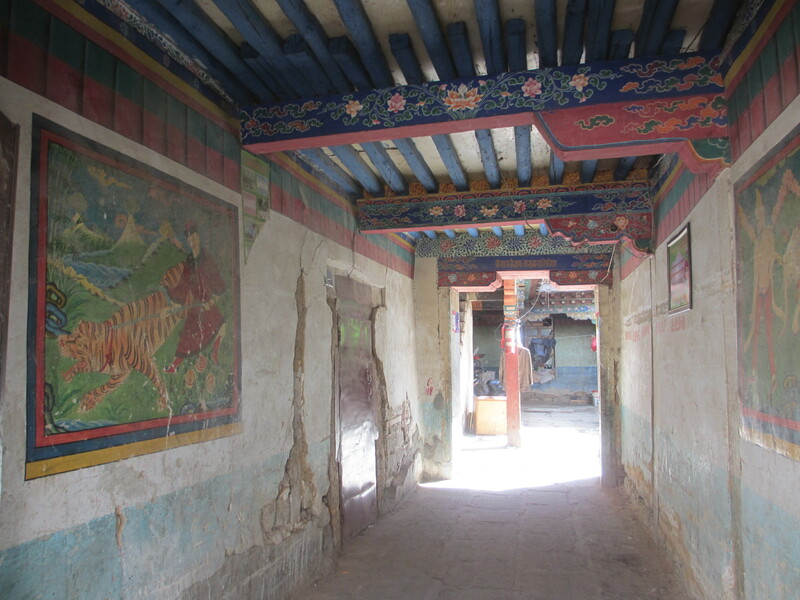 Some beautiful alleyways and courtyards in Lhasa. 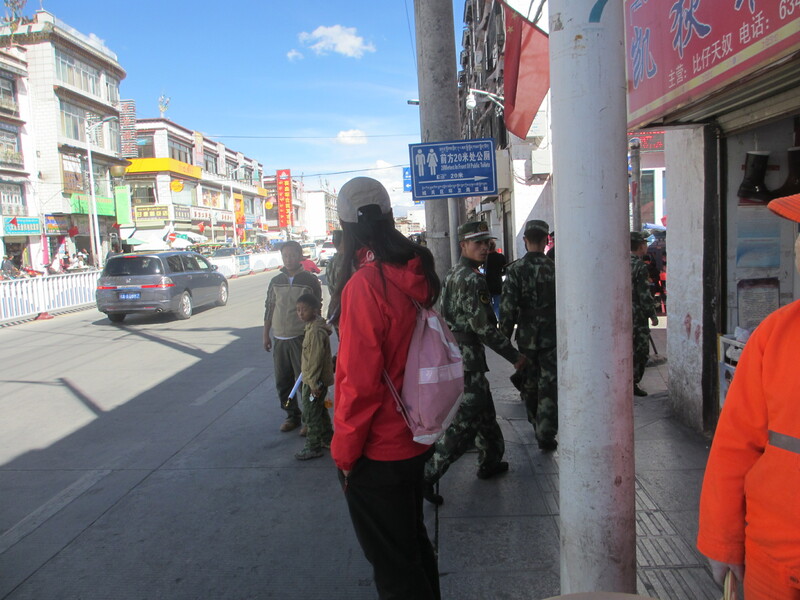 In addition to road blocks and security posts, garrisons and army barracks in every town and village in Tibet, there are police checkpoints on every street corner in Lhasa and Tibetans, particularly Buddhist lamas, are constantly stopped and searched. 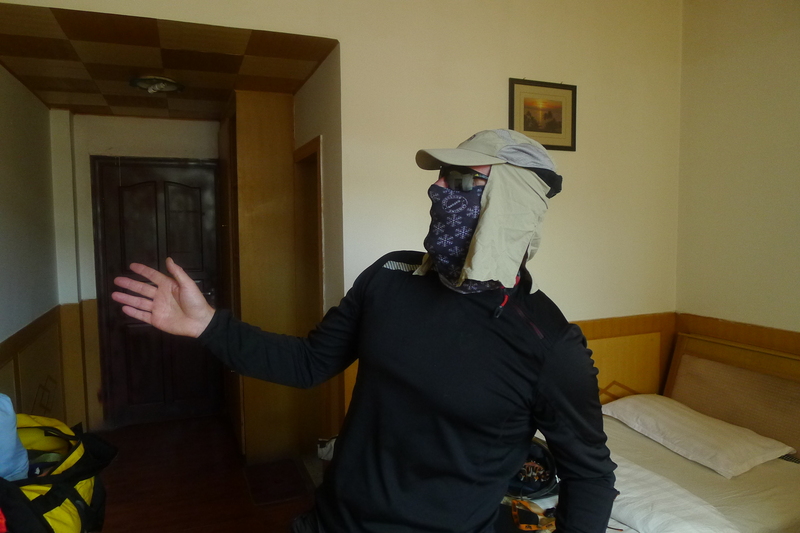 Whilst spending an afternoon with our friend Si Ba, I noticed he was constantly stopped and frisked by Chinese authorities. Keeping a close eye on the “lao wai” who didn’t appear to be in a supervised tour group. Some of them friendly enough young lads doing their job, but…. 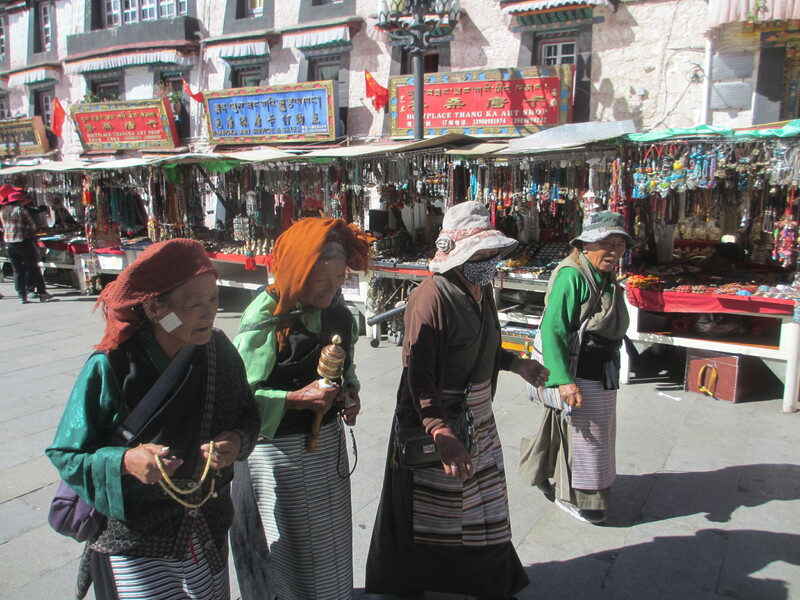 Local ladies walking through the markets and praying. 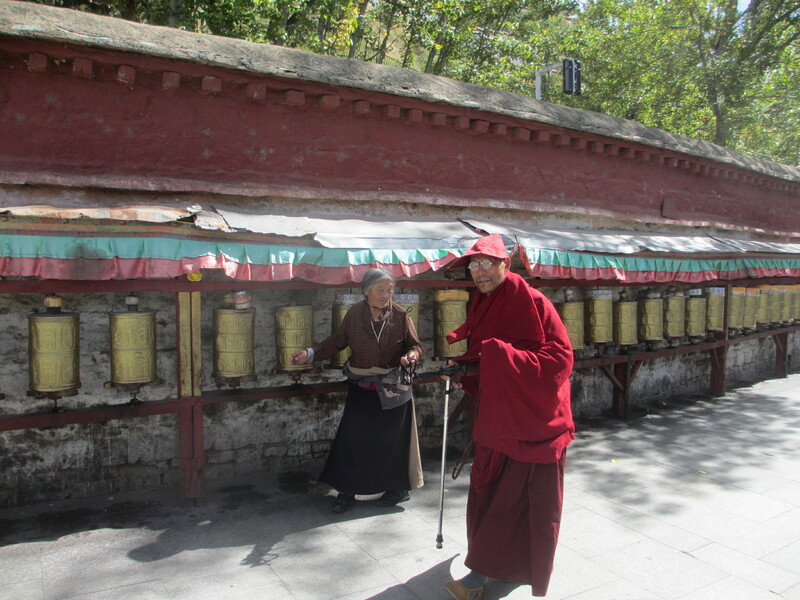 Lots of people walking clockwise around the “Da Zhao” Temple with prayer beads and prayer wheels. 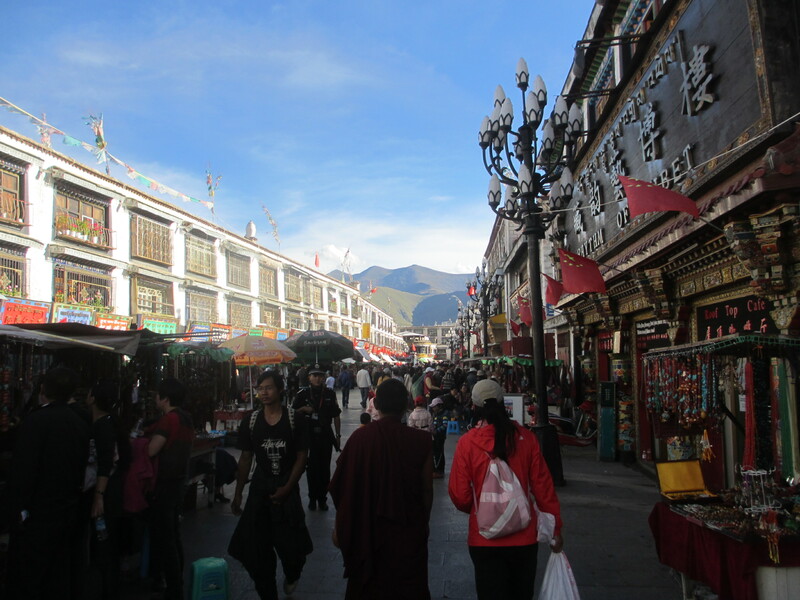 Tibetan streets, Chinese flags and skyline dominated by the beautiful mountains that surround Lhasa. 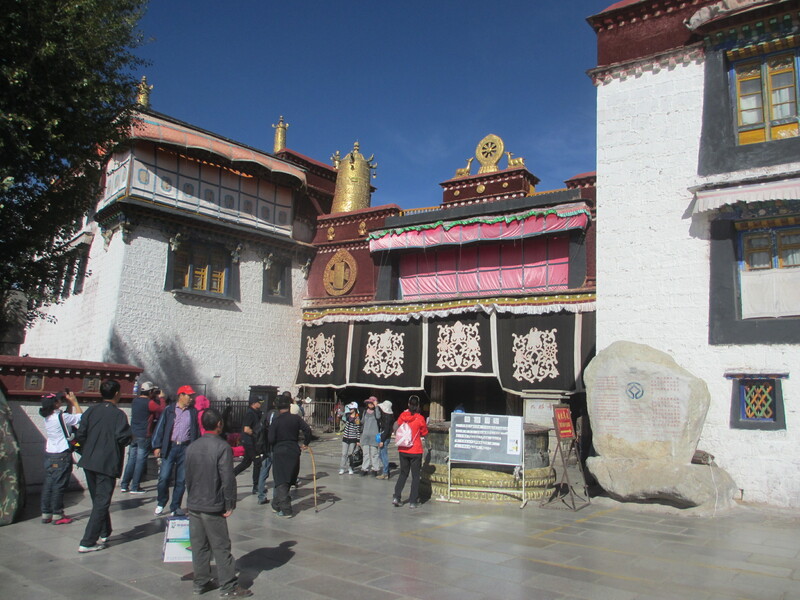 The “Bu Da La Gong” can be seen where ever you are in Lhasa. Fanny at “Da Zhao” Temple. 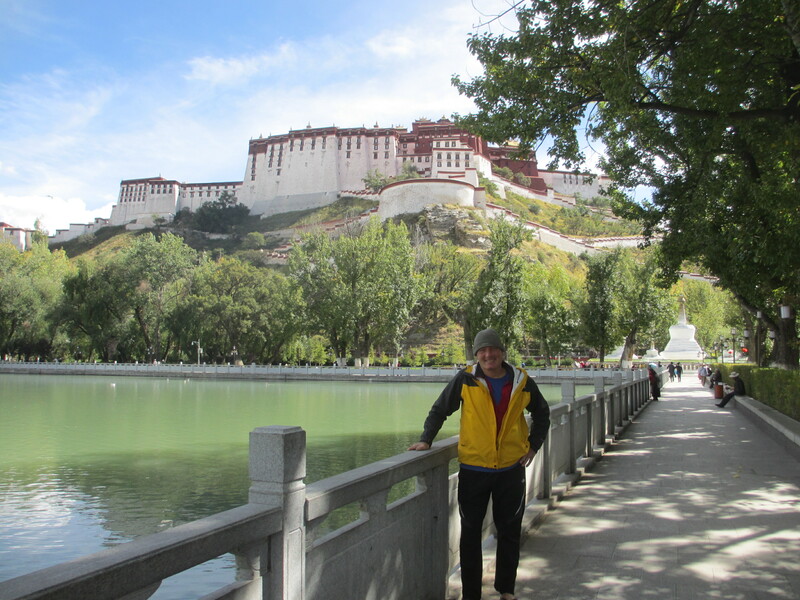 I lost my trainers and so I klomped about Lhasa in my riding boots… which got lots of admiring looks and comments from the local Tibetans. 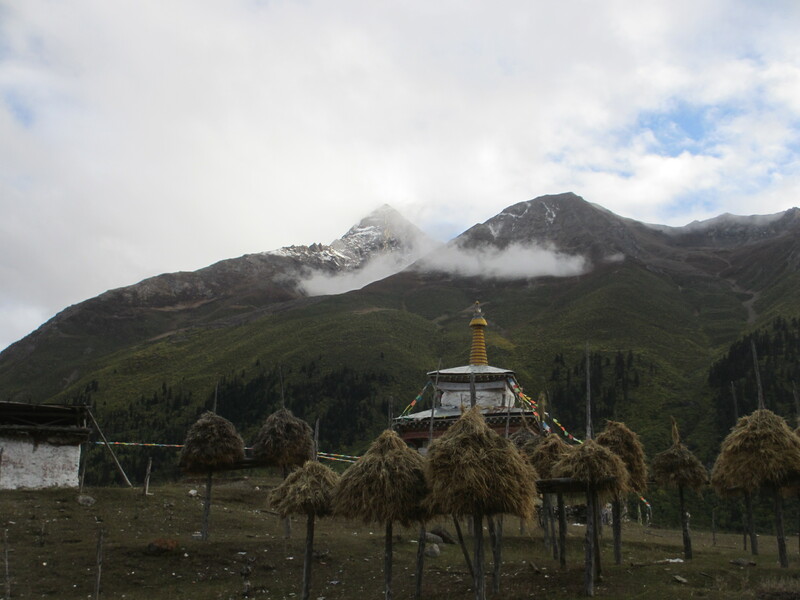 Tibetans are very devoted Buddhists and can be seen praying at most times of the day. 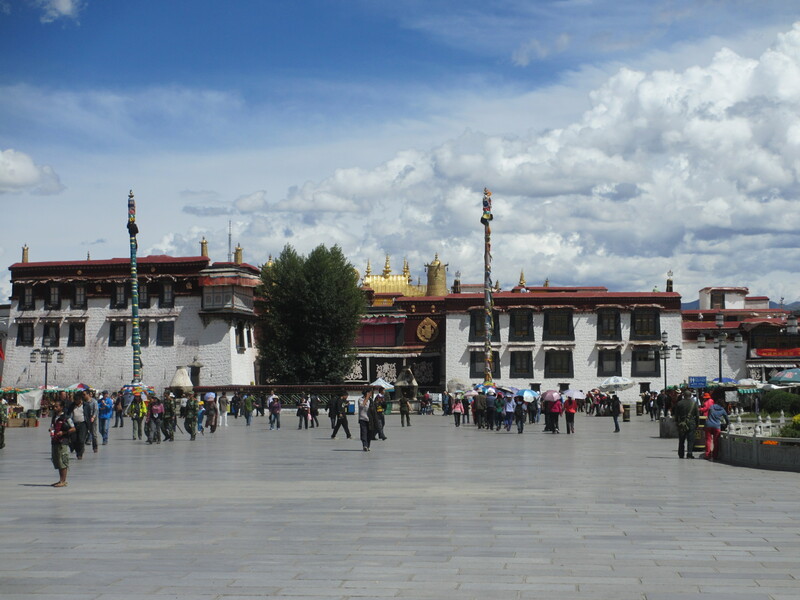 Many spend years on pilgrimage to Lhasa. Just to remind everyone whose in charge. Goose-stepping down the main road. Always a crowd pleaser. 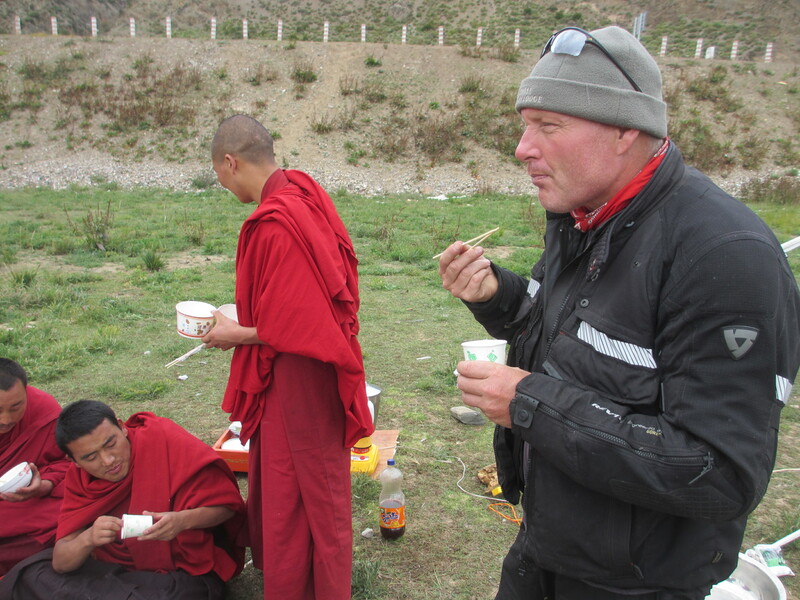 Having yaks milk tea and walnuts in a local tea-house with our friend Si Ba. 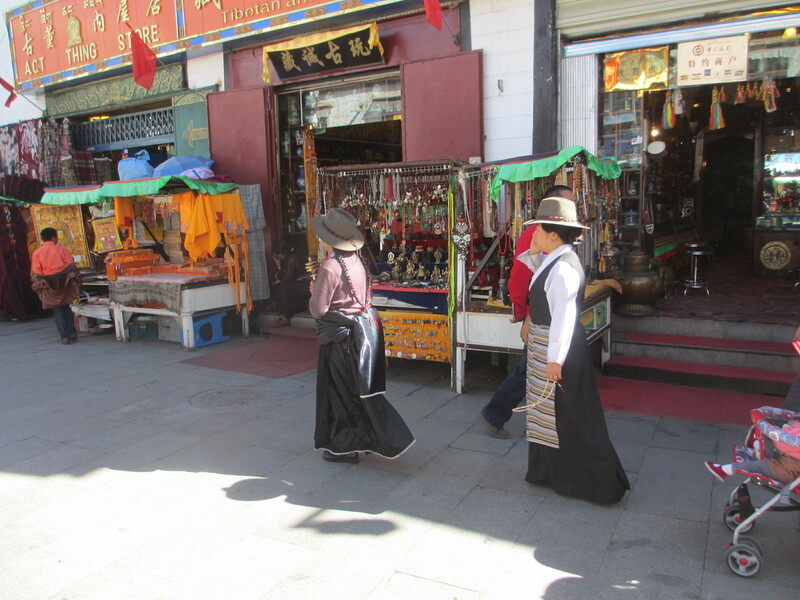 Many of the Tibetans look very much the Cow Boys and Girls that they are. 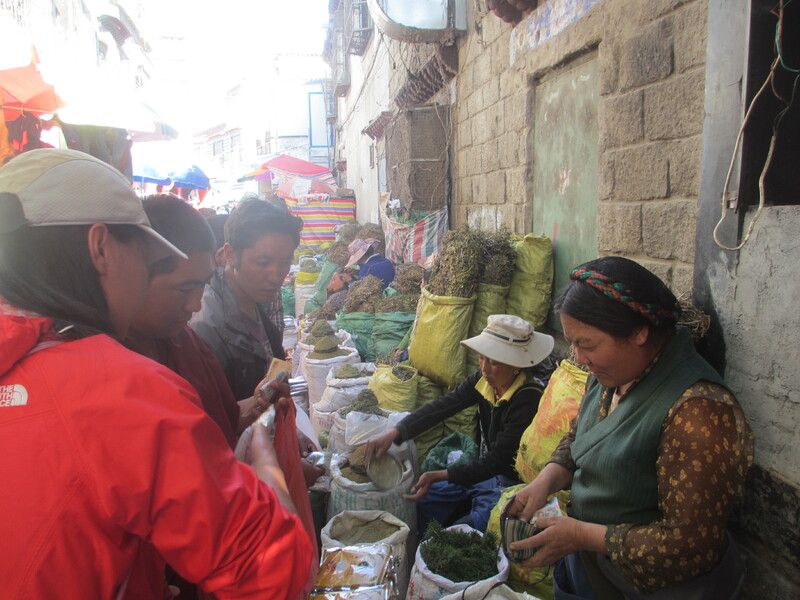 Si Ba and Fanny in the market buying incense for the temple. An interesting picture on many levels. 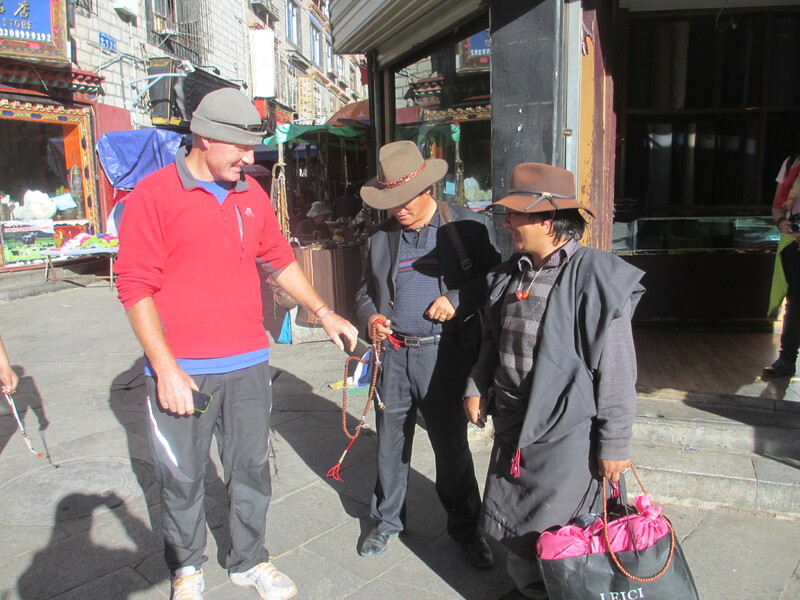 These guys offered me their prayer beads to hold… so I did. 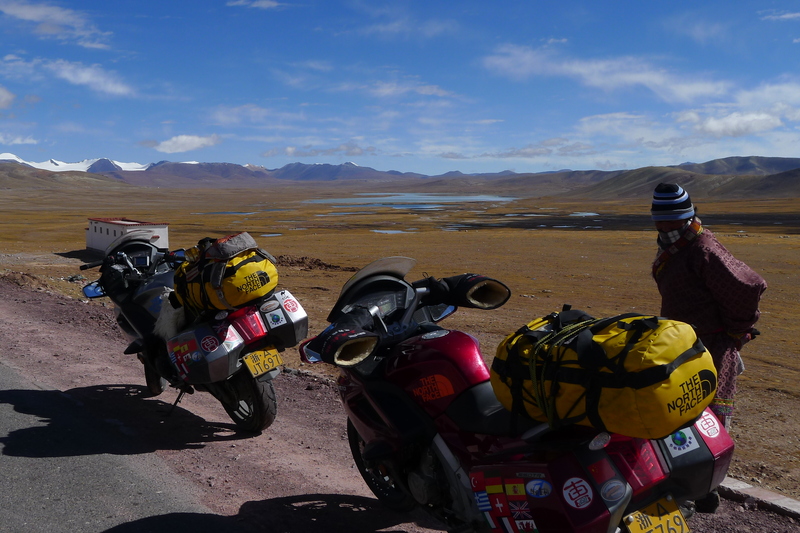 The tank of Fanny’s bike sprung a leak because a rubber supporting mount was missing and after 6,000 kilometers “on road” and “off road” it vibrated a crack in the attachment. A bit dangerous, especially as self immolation is illegal in Tibet. 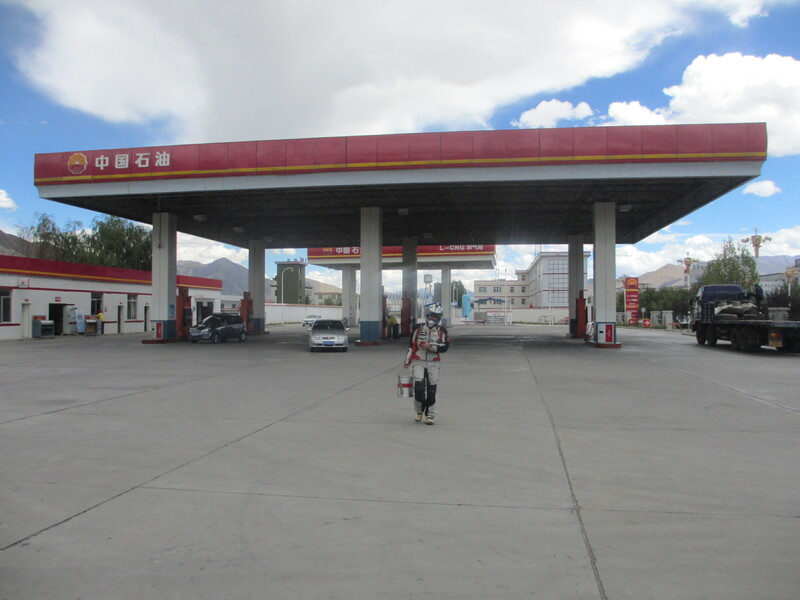 Therefore we had to ride with no more than 30% of fuel in the tank at all times which meant siphoning fuel from my tank for several hundred kilometers until we got a new tank in Lhasa sent from Hangzhou. All part of the testing program, I guess. 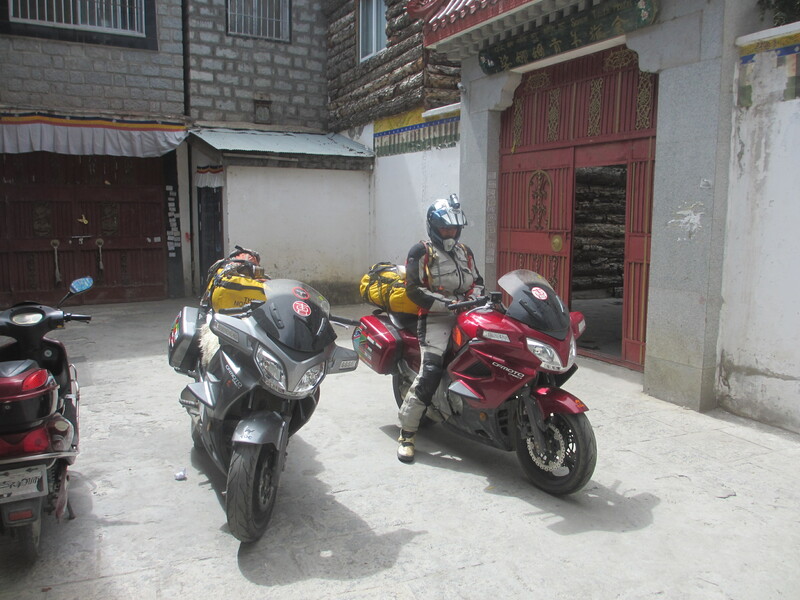 We continued with the totally ridiculous practice of having to fill the bikes with petrol in open watering cans, kettles and tea pots. 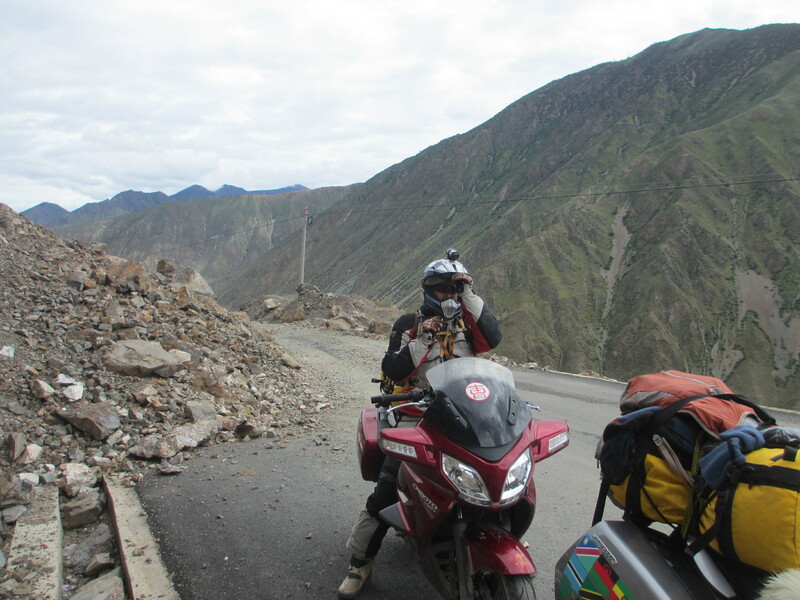 Unsafe, annoying and a hassle that invariably resulted in our petrol tanks being not full enough, or with petrol left over in the tea pots that we would donate to a fellow biker. Invariably we got petrol over everyone and everything as we trudged back and forth from the pumps. 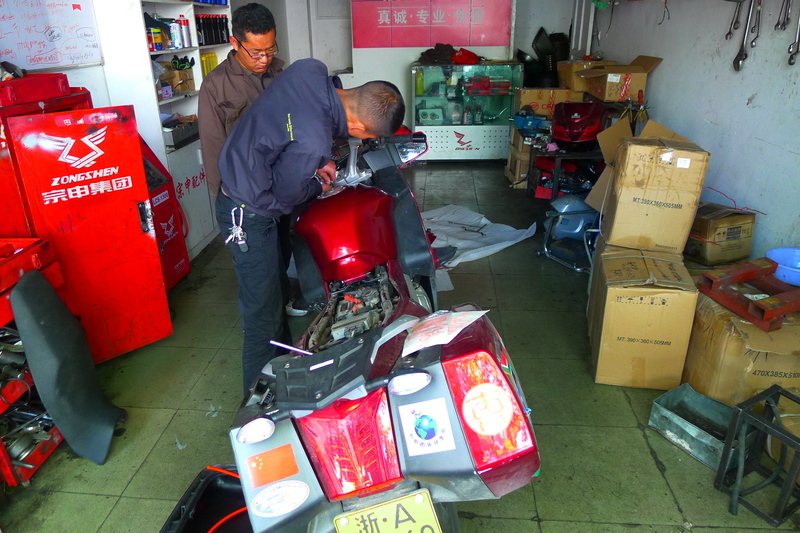 The logic was that nearly all motorcycles in China are peasant owned small engined machines that are neither safe nor well maintained and so prone to leak or even explode. The local authorities, therefore, stipulate that motorcycles and their cigarette smoking owners be kept a safe distance from the petrol pumps. 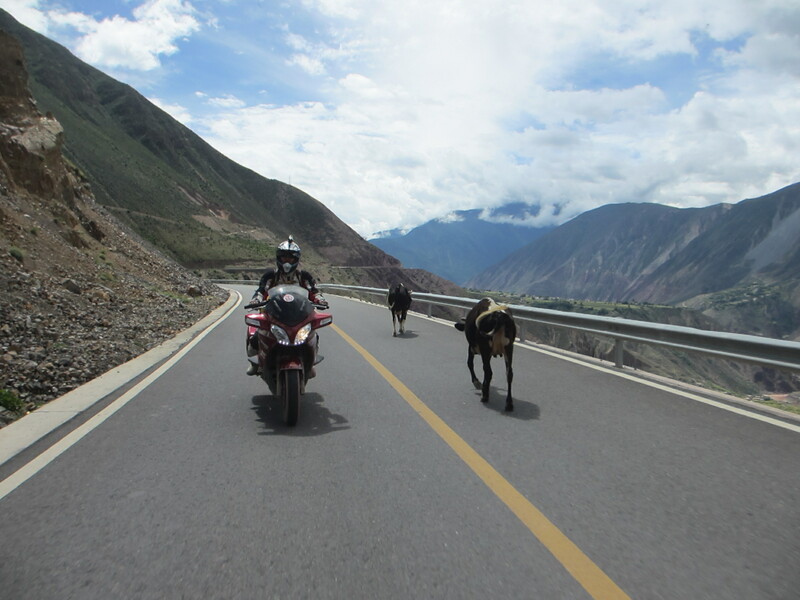 In most of China, and particularly the wild west, modern large engine motorcycles found elsewhere in the world are unheard of … and so given that they have two wheels are subjected to the same logic…. just like their ban on Chinese highways. 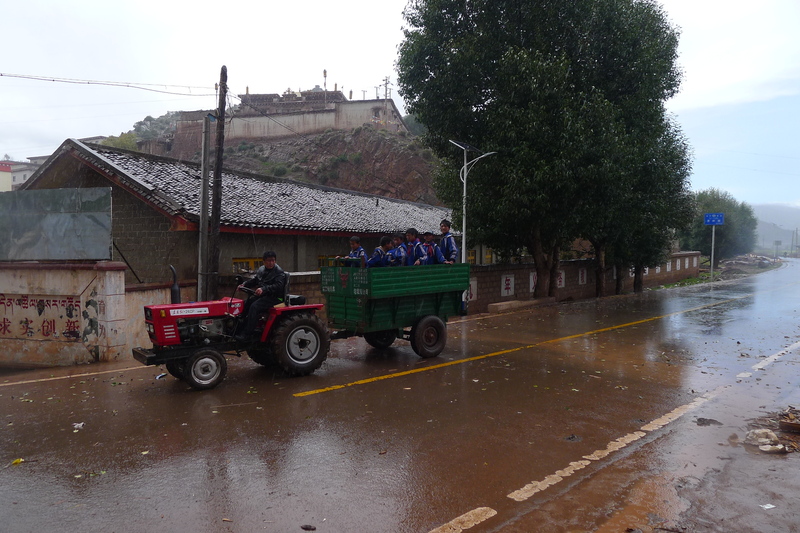 I am surprised there isn’t a Chinese Chengyu (idiom) “Four wheels good… two wheels bad”. Back riding with the big peaks again. 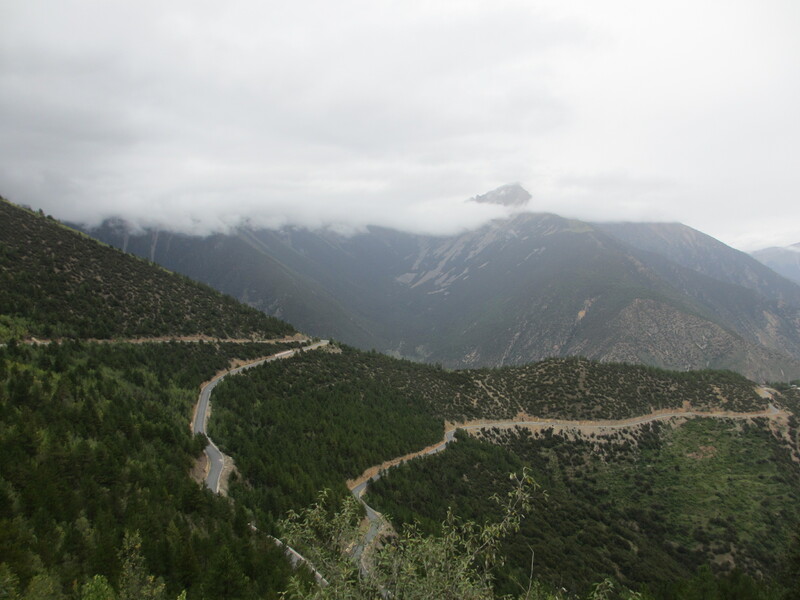 Beautiful roads weaving between peaks and rivers high up on the Tibet-Qinghai Plateau. 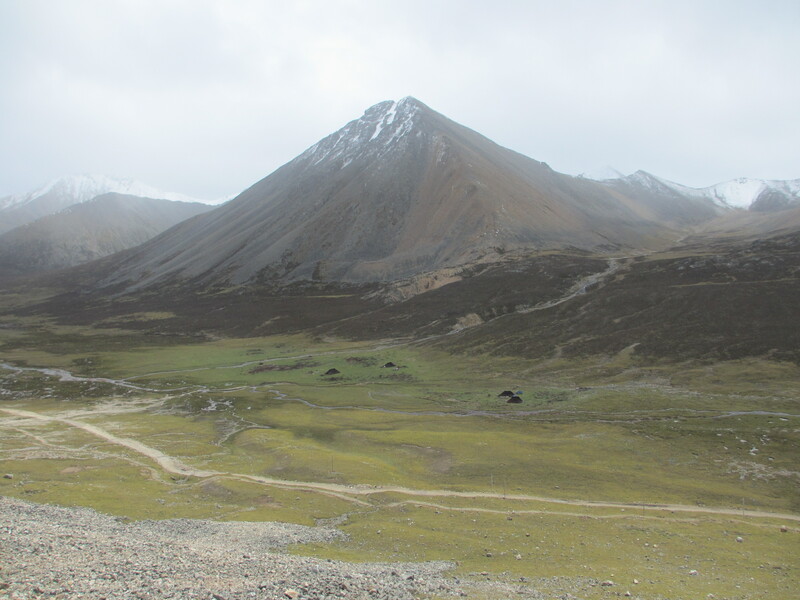 Mount Everest (珠穆朗玛峰）… which I never saw because the authorities would not let me ride the 80 kilometers or so from Tingri to Base Camp. 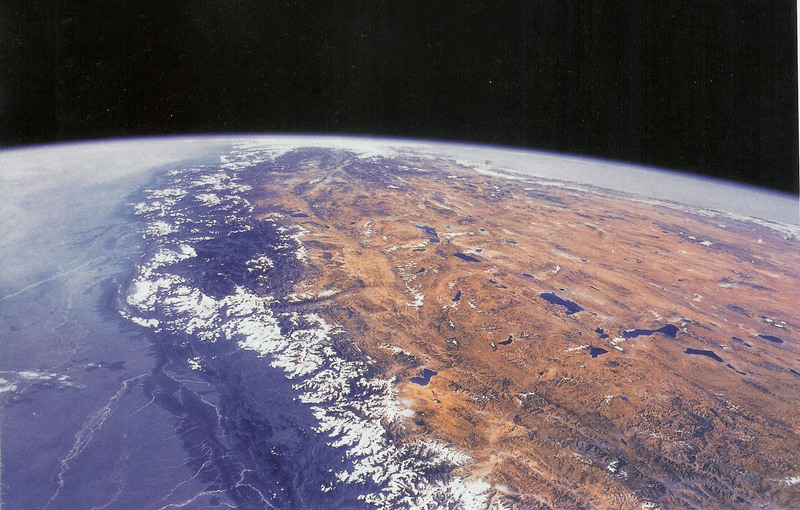 Despite having Hong Kong papers and documentation I was deemed by my fellow human beings to be the wrong race to look at the tallest mountain on our shared planet. Fanny did all she could to help and support me but it was no good …. I guess we’ll see it from Nepal one day. 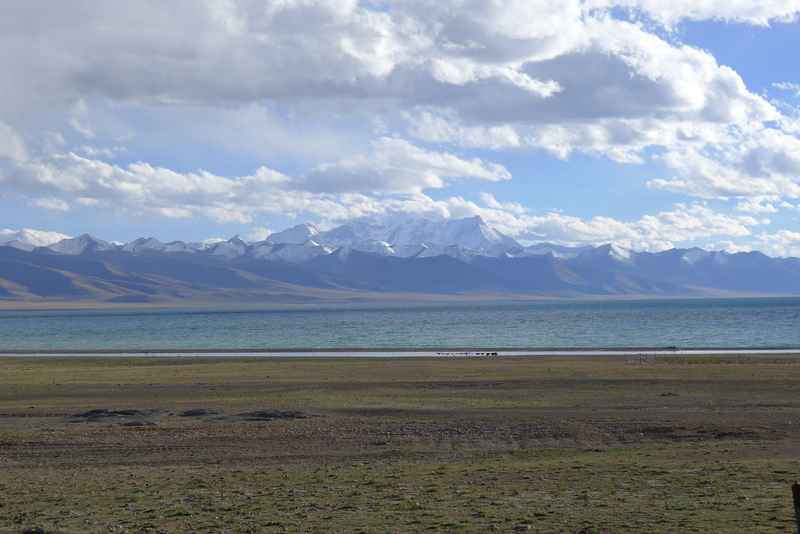 The sacred Sky Lake (Nam Tso) with 7,000 meter peaks in background. 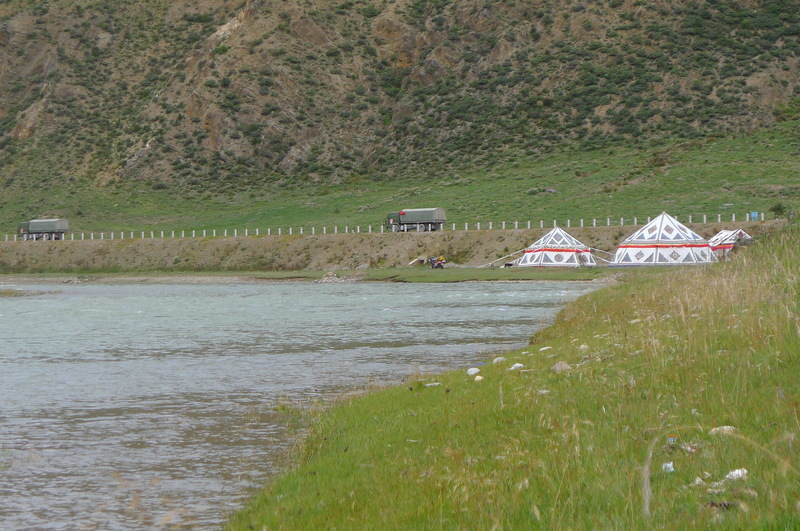 Camping next to sacred Nam Tso Lake at 4,900 meters. 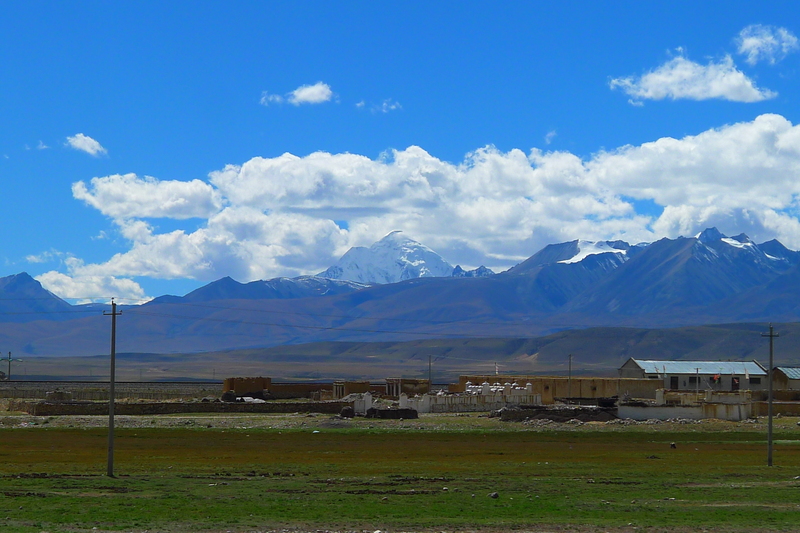 The mountain in background is Yan Qing Tang Gu La at 7,800 meters. There is a local saying that when you are here you never think of home. 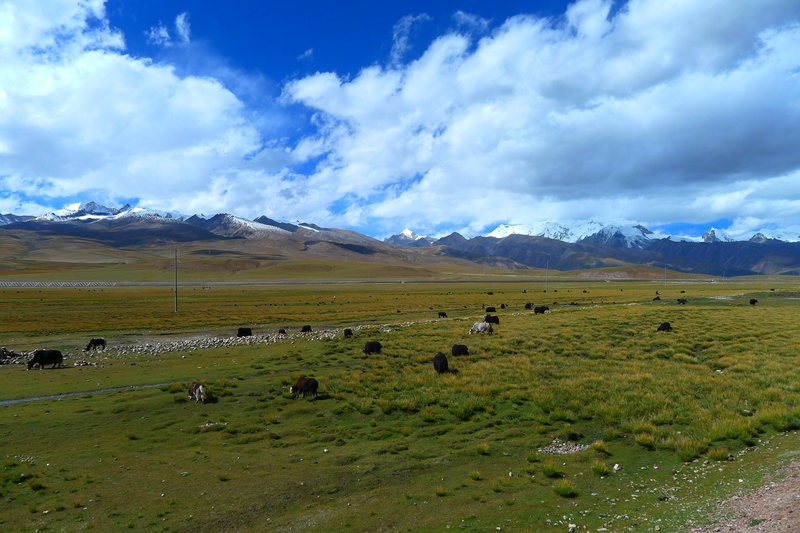 There were lots of semi wild, huge and woolly Tibetan dogs. During the night the temperature plummeted to minus 15 degrees and so the dogs slept right outside our tents pressed up against us… keeping us both a bit warmer. 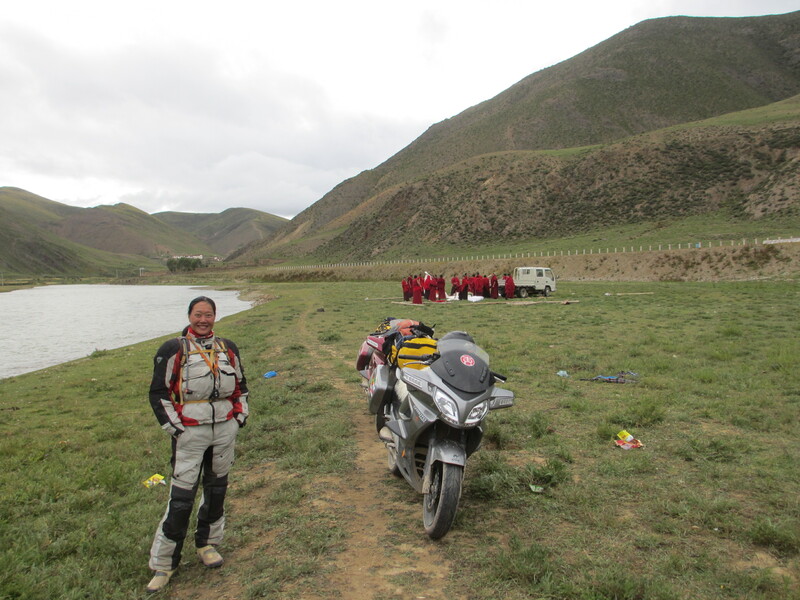 At border of Tibet and Qinghai. Bit cold and pleased I invested in the bar mitts. Fanny thought they looked daft but changed her mind in the snow and cold. 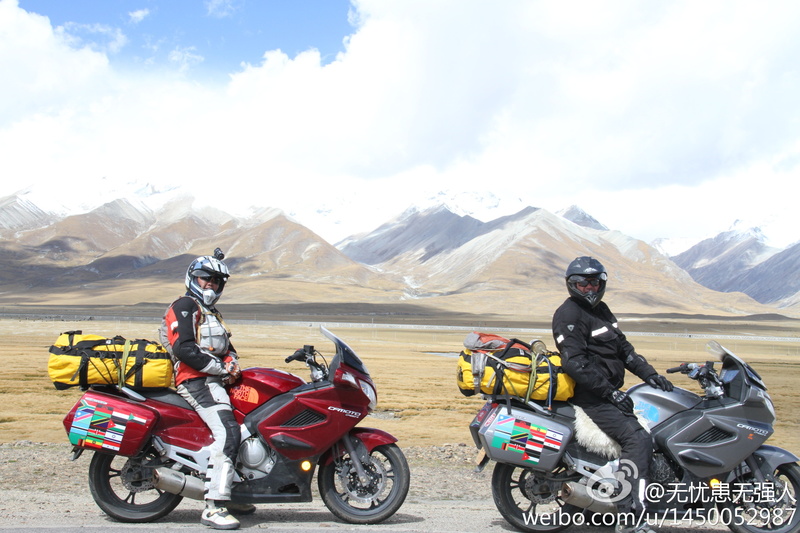 The last 5,000 meter plus pass before crossing into Qinghai. 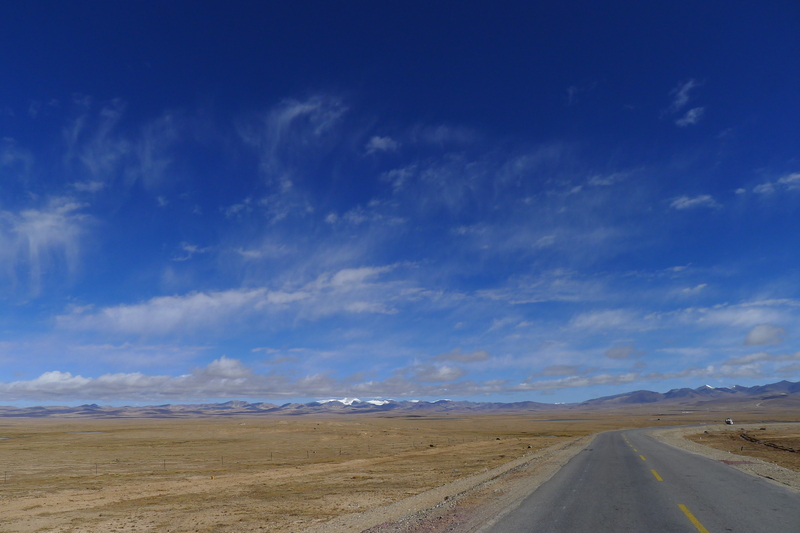 Amazing skies, clean air, big spaces and long roads. 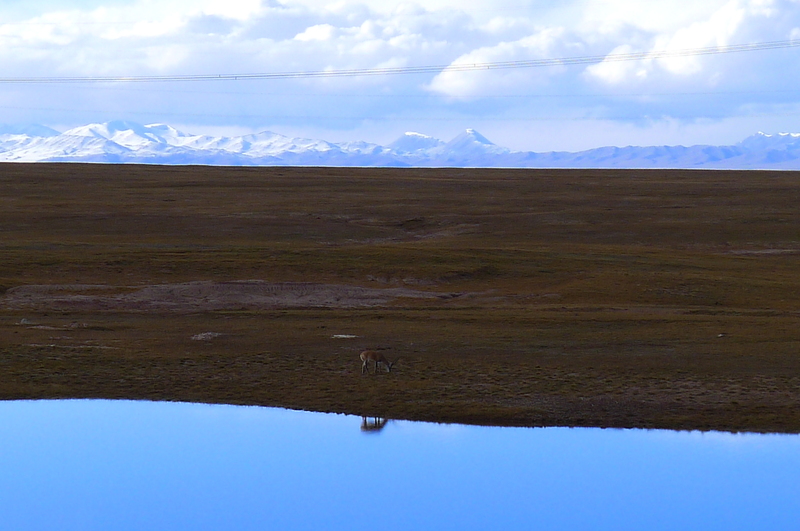 5,300 meters … high altitude lakes, snow peaks, and permafrost plateaus… quite stunning. 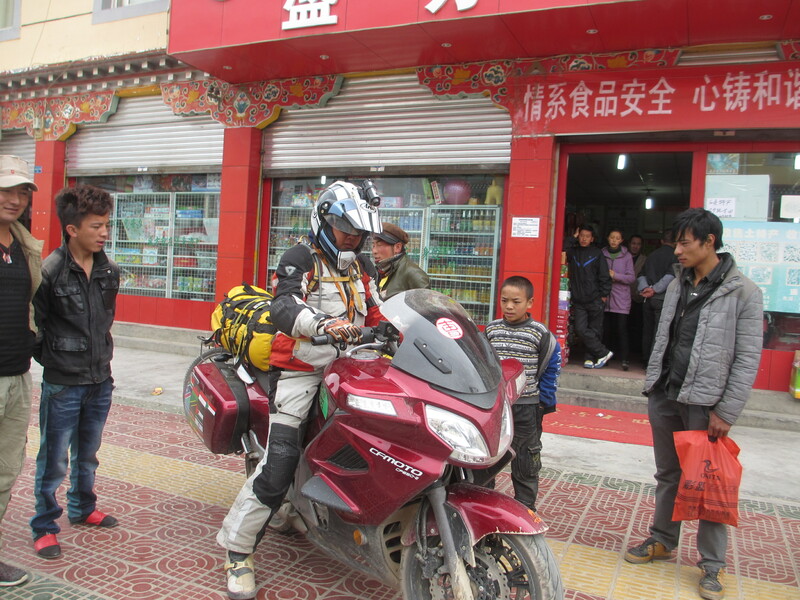 This entry was posted in Bikes, CF Moto 650TR, China, Fanny, Mechanics, People, Preparations, Rupert, Tibet, Uncategorized, Visas, Yak. 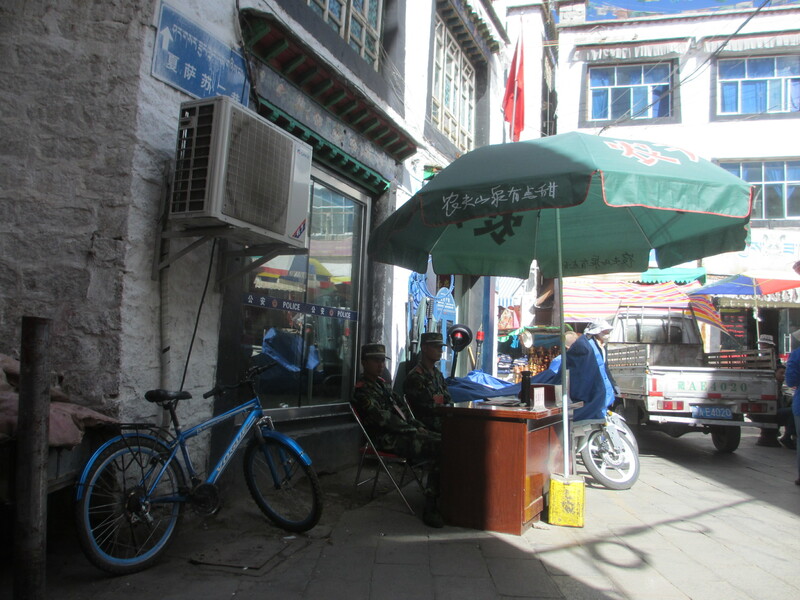 Tagged bike, CF Moto, convoy, 珠穆朗玛峰， yak, Dalai Lama, Everest, 西藏， 中国， 少数民族， China, GPS, lama, motorcycle, police, Road Block, snow, Soldier, tea, temple, Tibet， cf moto. It seems as though the bikes did really well. 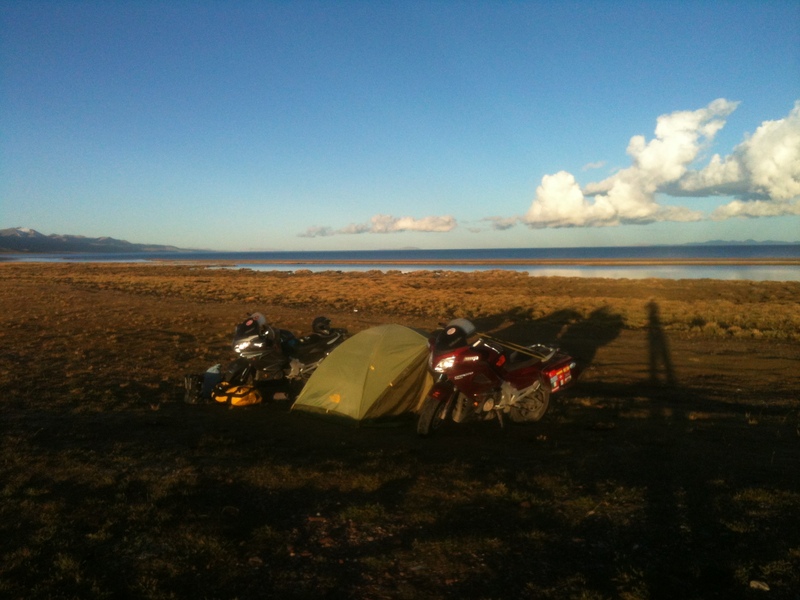 Not sure if I may have missed it, but what was the total distance covered… what is your overall impression of the bikes? The 650TR is an excellent bike and great value for money. 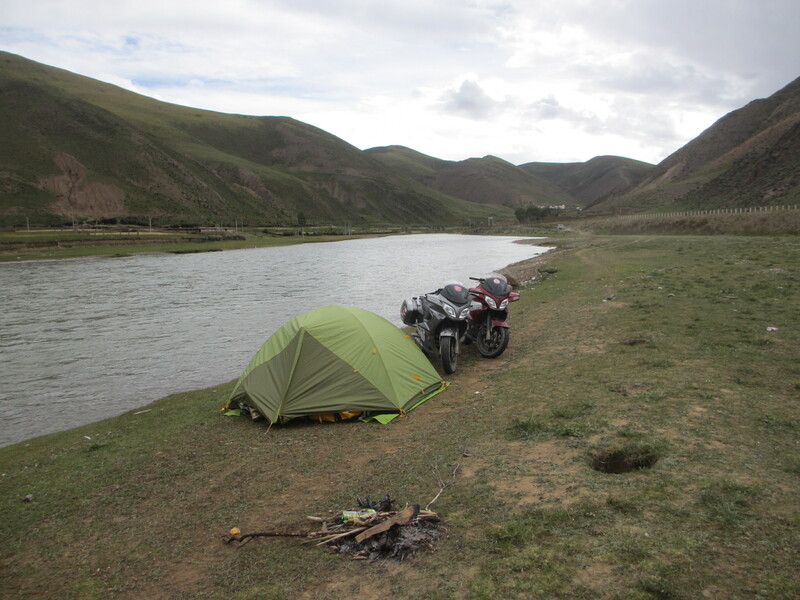 We did 15,000 kilometers across China… it was a long way and the bike was good for all of it. We chose the CF Moto as it has a good reputation in China, a very good service network and its best large engined bike being made. We saw the factory in Hangzhou. Very impressive. A few issues which I talk about, but CF Moto will attend to those in future productions… (mirrors are not great for instance). I am writing a review for several magazines.. not published yet. We are thinking of getting a CF Moto 650NK for Hong Kong.. Good street bike and same engine as TR. Are the magazines that ypi are writing the bike revieqs for available in the UK? Would really like to read your full review on the bikes. Maybe you could post here when the reviews are published and available to purchase and which magazine they will be published in. The quick answer is No, Tony. 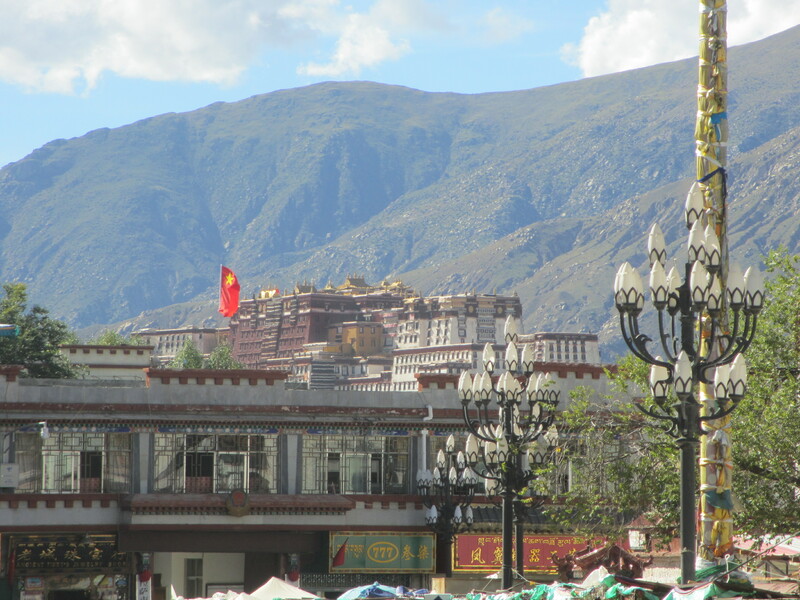 A couple of UK magazines inquired about Tibet leg of tour, but nothing has come of it. In the UK the magazines are not really interested .. they have Ewan and Charlie and many other more accomplished Brits motorcycling here and there that they can write about. Also, KTM (or indeed CF Moto) doesn’t have the marketing clout of BMW, Triumph and the Japanese bikes and the magazines rely on advertising revenue to survive. In China however, its a different matter and Fanny has a following of millions. China is rapidly evolving, has a middle class larger than the population of the United States and they are discovering all sorts of hobbies, sports and activities that until recently they had no access to. Fanny writes 8 pages every month for Top 4×4 (越玩越野）magazine and several online forums. 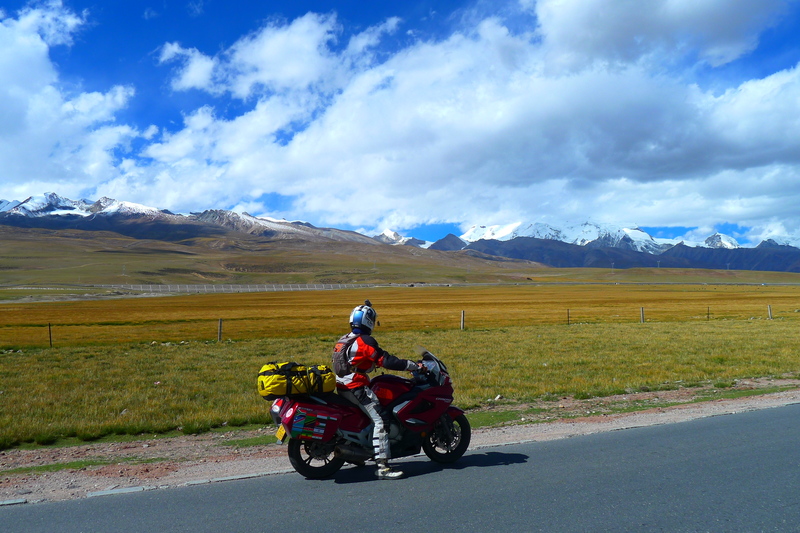 She writes about one country each month and its a mixture of our motorcycling adventures and her observations as a Chinese woman traveling through different countries and meeting local people. Very popular. I have written a long technical review on the CF Moto TR650, but no one is really interested, and so I sent it to CF Moto so they could improve upon the shortcomings. They were kind enough to lend us the bikes, were very good to us and I like the CF Moto people I met and happy to help out in anyway I can to succeed and improve their motorcycles. 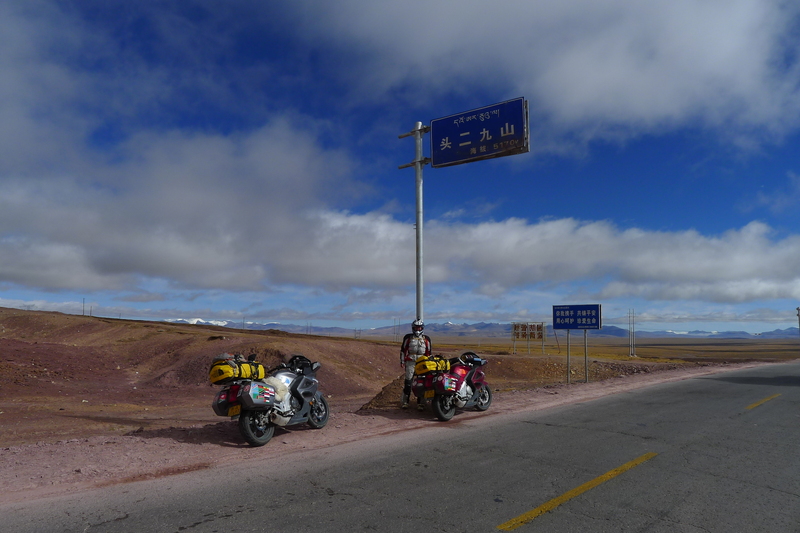 This blog is now finished and I have given up the idea of a book (for now) and so Fanny and I shall keep it for ourselves so we can look back fondly on our Big Bike Trip in years to come. Both of us back at work in China/Hong Kong. Amazing, really jealous you can solo through PRC on your HK ID. 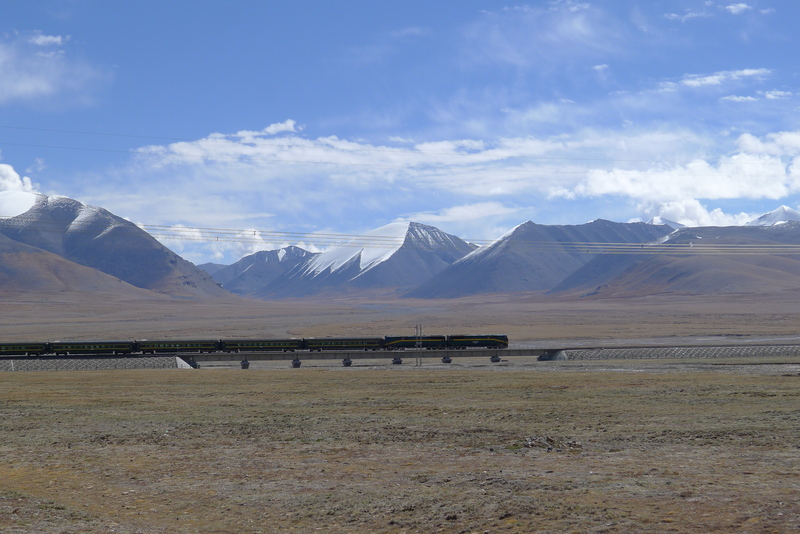 I’d love to include PRC in my overland route back to AUS, but from all reports is prohibitively expensive, restrictive, requires a guide, etc etc. 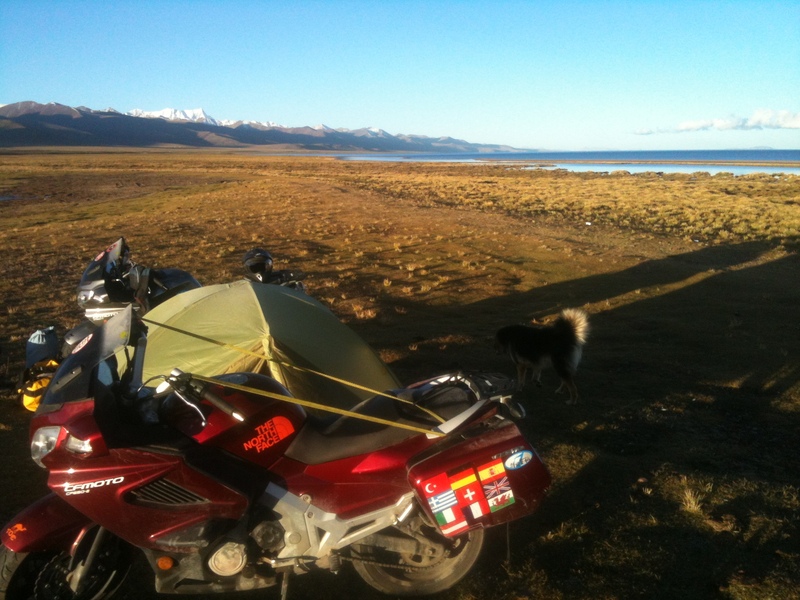 As it is, I’m looking at joining a group to do the KKH, but that might be the extent of PRC I see. 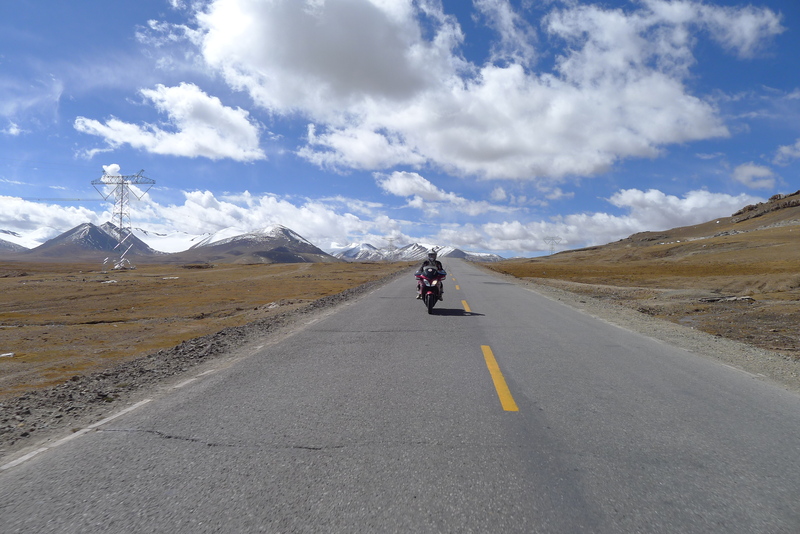 Let us know about the KKH … we missed it, but it as in the original plan. 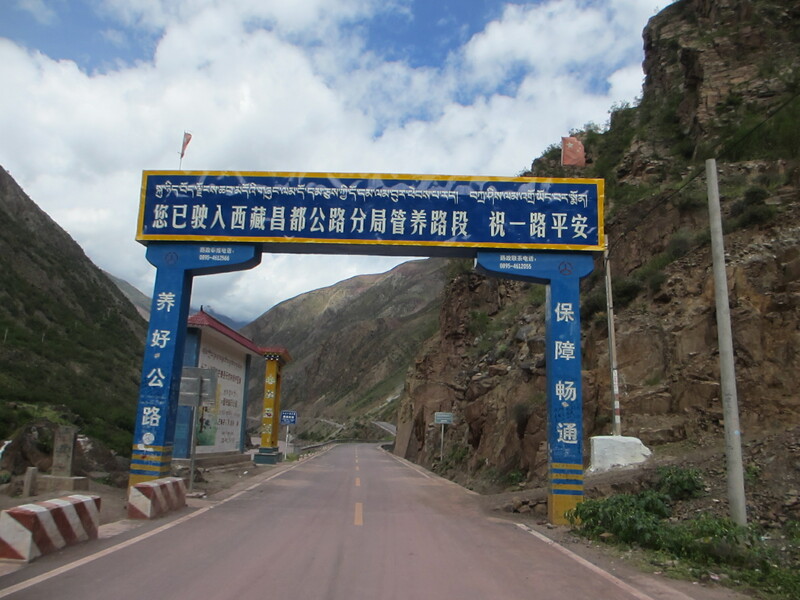 It connect to Xinjiang province. 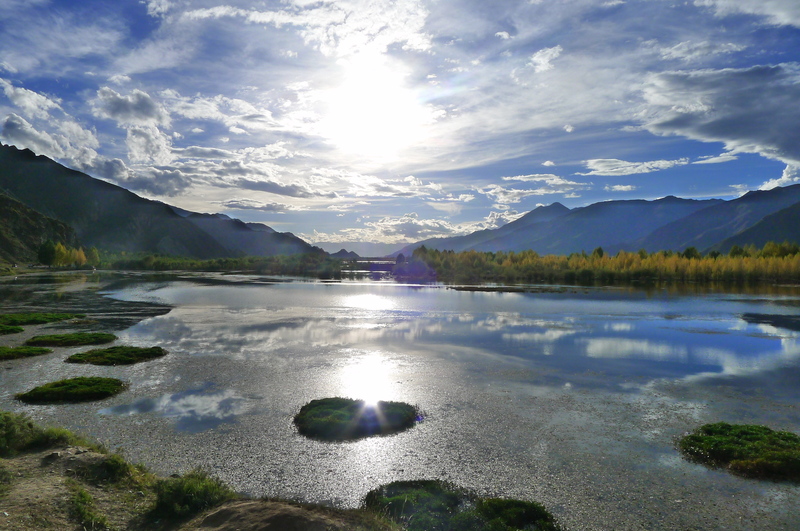 make sure you check out Sichuan, Gansu and Qinghai .. also amazing.